Garden Design magazine known for its in-depth articles and awesome images has a clean and easy to read design, free of ads. Over the years, I have started and stopped my subscriptions to different gardening magazines, but I will never give up this one. I don’t review many print publications, but I felt that this one richly deserved to be recognized. Not available at the grocery check out line, it is primarily available by subscription. But if you are interested in nature, ecology, cooking, design, gardening, traveling or simply beautiful images, this would be the magazine for you. With 132 pages, there is plenty of space to cover diverse subjects that would appeal to amateur as well as professional gardeners. Most garden magazines have brief articles and I often crave more. 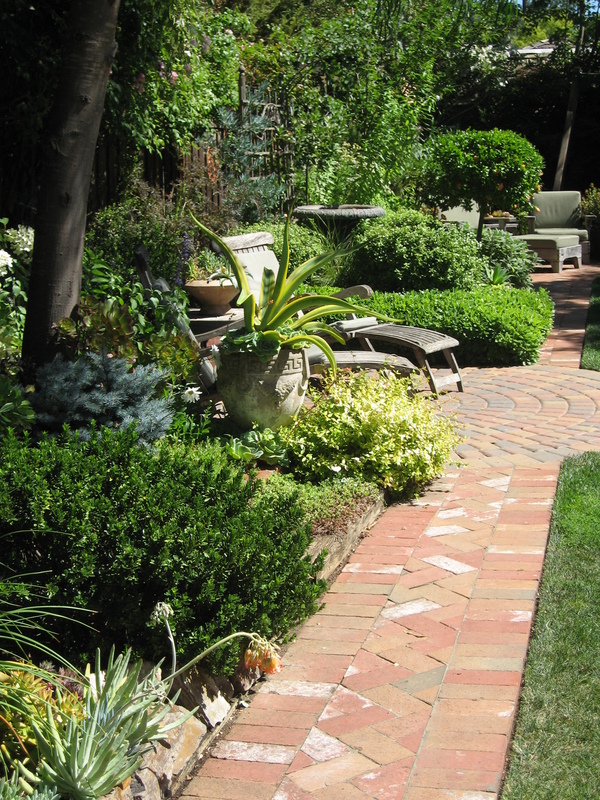 In Garden Design, the articles can run 10 to 12 pages long to really get an in-depth look. 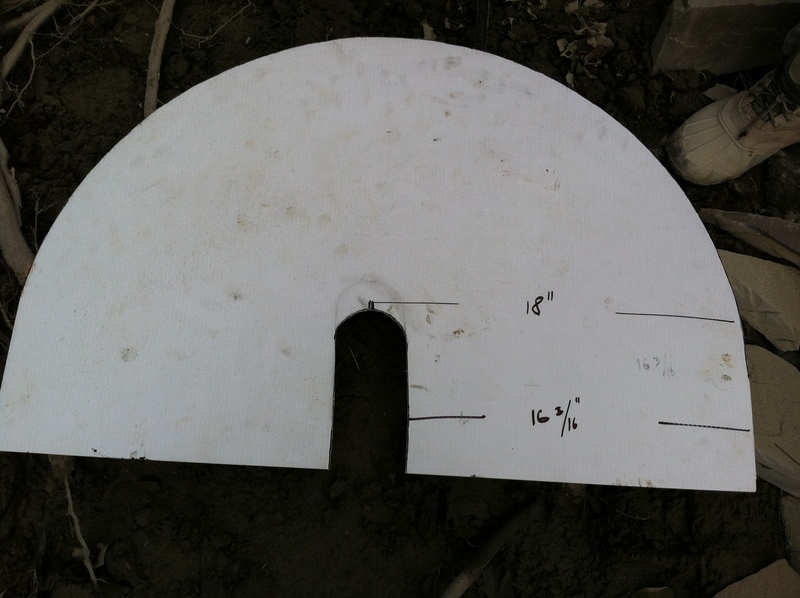 What flower can reach 12″ across and up to 18″ long? That is Hydrangeas’ main claim to fame, according to Garden Design article ‘Old Reliable, New Tricks’. The commonly asked questions of how to prune and change hydrangea color is demystified in this informative article. These two questions are asked by many enthusiastic gardeners as there are so many different varieties and treatments for each particular kind. Using Garden Design magazine as a great design resource, and also for stellar articles on plants, containers, and pollinators, it is always sitting on my desk. More like an add-free soft bound book, I welcome it to my house every season for eye catching photos of gardens, design ideas, and great plant selections. Printed every three months, I am not deluged with monthly issues but instead have a seasonal reference at my fingertips. The design posts will make your mouth water with all the delicious combinations of plants and good design components. My design of a healing labyrinth made the on-line Garden Design magazine when the magazine went on a brief print hiatus a few years ago. The magazine came back stronger than before chock full of garden inspiration. And the article by Janet Loughrey, ‘Spanish Lessons’, highlighted three Mediterranean landscapes that show the best of waterwise design. I drooled over these images! Visiting different gardens is also covered and Pennsylvania’s Longwood Gardens is featured in the latest issue because of the fantastic new fountain show. Perfect timing, as I am visiting it this weekend. Another mentioned event that I would love to go to is the Swan Island Annual Dahlia Festival. Located in Oregon, strolling and ogling 40 acres of dahlias in full bloom is my idea of a good day. I’ll make it there someday. A find of a box turtle is always happy but all too rare, and the article by Doug Tallamy explained why. Habitat fragmentation is the main culprit that has placed this species on the Threatened Species list as “vulnerable”. Fulfilling the important job of seed dispersal, Tallamy gave pointers on encouraging these great little natives. Exceeding 100 years old if conditions are right, I learned how to make my property better suited to the colorful turtles. 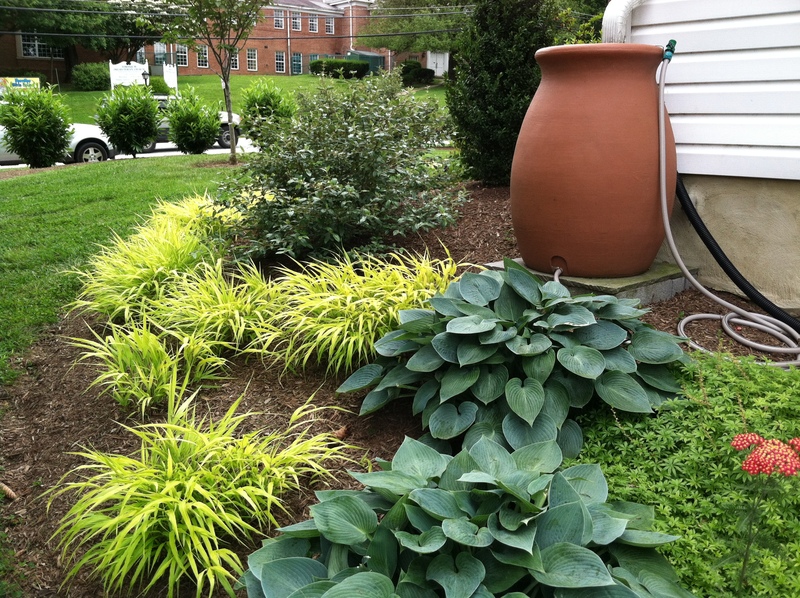 After doing my post on Watering Like a Pro, reviewing Dramm products like ColorStorm hoses and Rain Wands, the current article about watering tools in Garden Design “elevated this perennial garden task into a real pleasure”. Quality of your tools makes a huge difference in your garden enjoyment and reaffirmed my watering tool selection. As a beekeeper, I appreciated the article ‘Darwin’s Beekeeper’. Letting nature take its course reflects my policy on beekeeping perfectly. And the foldout on pollinators is pretty enough to be framed. 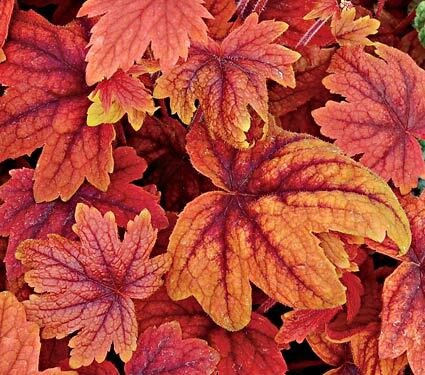 The progression from early to late bloomers is essential information and includes both tree/shrubs, and perennials. 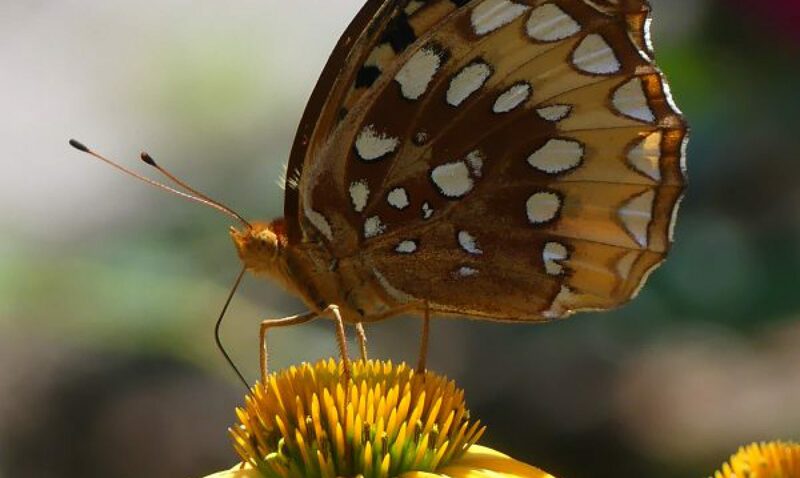 Go to my post on Pollinators for more information on what plants to select to attract a wealth of winged beasts to your property- and keep them coming back! Probably one of my favorite sections is Great Gardens Across America. Showcasing gardens anywhere in the country, the stories and material and plant selections are always interesting to me as a garden designer. No matter what zone or coast you live in and what type of nature lover you are, you will find inspiration from this magazine. Full disclosure: Garden Design magazine is not paying me for this review! Old houses are so picturesque and have lots of charm inside, but outside can be a different story. I got a call for a job for an early 1800’s house that had been decorated to the nines inside but lacked the same appeal on the outside. There were several obstacles-one was the imposing curved brick wall around the sun room with the steep drop down to the lower level (lower blue arrow). 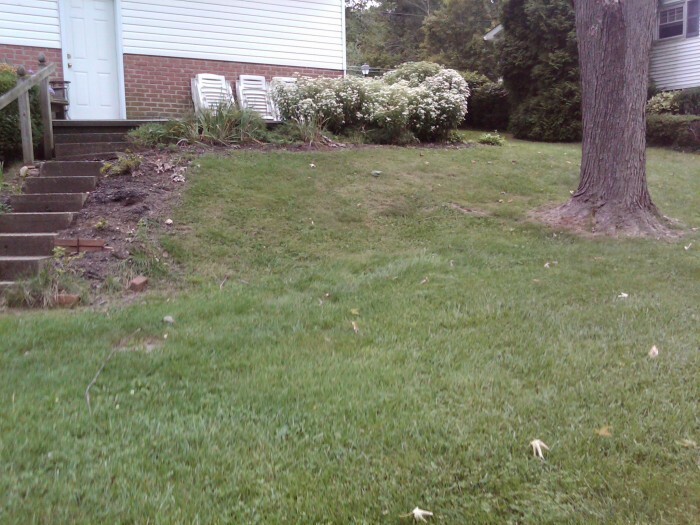 The other was the very small exit from the brick surround to the grassy area, only 2 1/2 feet wide (upper blue arrow). The first order of business was to add a mortared blue stone patio behind the mud room (small off-set room), replacing the old brick pavers next to the house. Adding six or seven large four to five feet wide guillotined steps curving down the slope took care of the steep drop from the patio. We filled in the old narrow opening with new brick and removed old brick to create a wider five foot wide opening making for easier access. At the bottom of the steps, large steppers curved around the imposing brick wall. 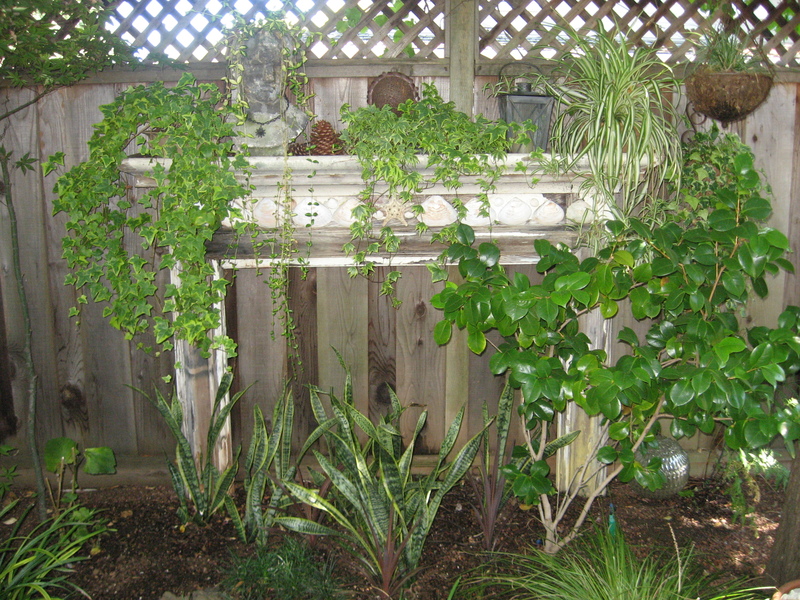 A small water feature was installed on the upper patio. Right outside the mudroom door we built a small entrance patio to the larger patio. 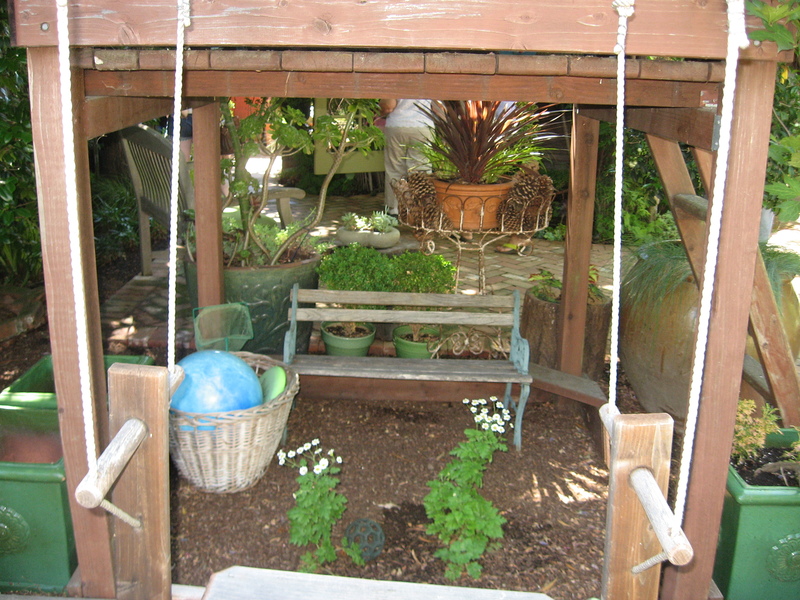 A sitting wall encircled the larger patio to give additional seating room. Lighting was installed around the patio and down the steps. The lighting was partial shade and I didn’t have to worry with deer as the house was surrounded by farm fields that interested the deer more. Between the wall and the steps, I planted Serbian Cypress, Microbiota decussata, an evergreen ground cover that stays low to the ground and is quite beautiful. It looks like juniper but has a softer texture and doesn’t have the disease problems that junipers can get. On the right side of the steps, I planted pink drift roses which bloom all summer long and stay low and mound like. 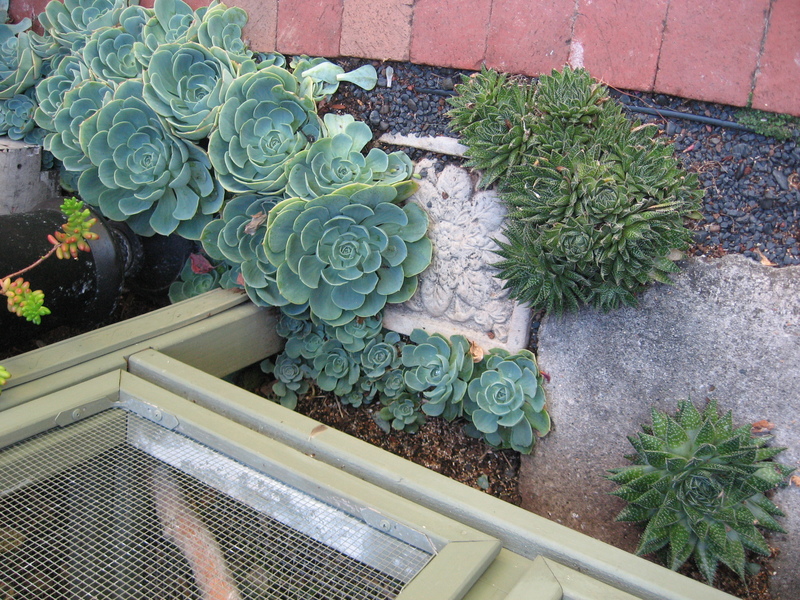 The gold perennial between the steps is ‘Angelina’ Sedum. Around the base of the steps, I planted ‘Guacamole’ Hosta, ‘Patriot’ Hosta, variegated ‘Solomans Seal’, Japanese Painted Fern, and ‘Limelight’ Hydrangea for some height. Down on the existing patio there was a foot wide strip of soil that needed plantings and I chose ‘Frances Williams’ Hosta for its spectacular size and leaf markings. 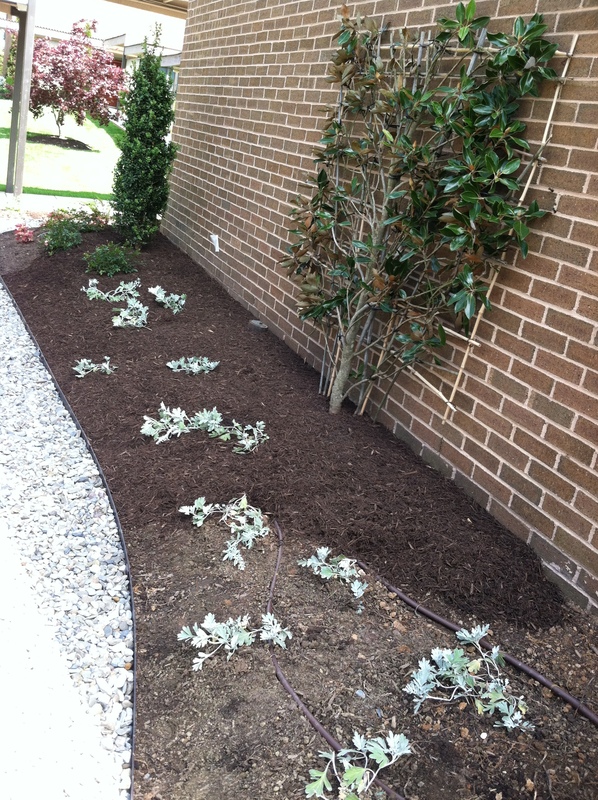 Additional plantings were added around the house to spruce it up when the rear patio and plantings were completed. A tri-color Beech gives the shady side planting bed a pop of color and and vertical element. One of my favorite design jobs landed in my lap about 5 years ago. I really didn’t know what to expect when I first visited the property – a modest home set on a busy road with a huge level back yard. There was a small steep slope out the back door with some ancient concrete steps. Seeing this slope for the first time with a crumbling deck and scrubby perennials dotting the hillside, I was struck with the possibilities right away. Turning a liability of a steep slope into an asset of a beautiful waterfall was right up my alley! This was a perfect solution to a problem area. 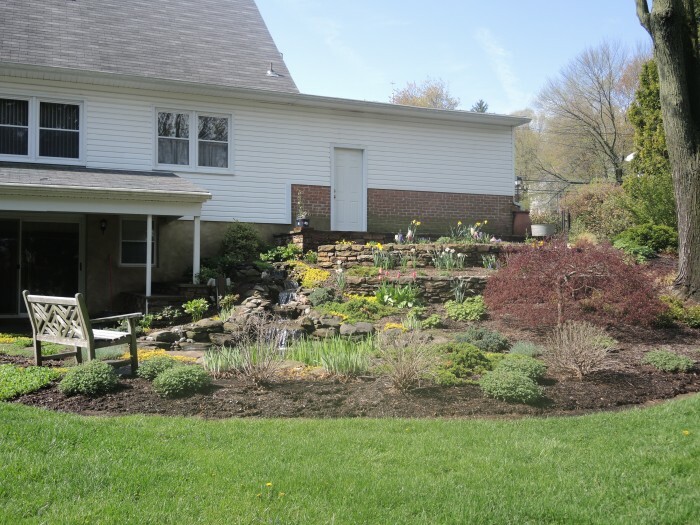 For the slope immediately below the deck, I designed two terraced walls of Western Maryland fieldstone, a native stone that blends in nicely with its colors of greys and tans. Using two lower height walls are preferable to one high wall, and each one ended up being about 2 1/2 feet high and curved around following the natural contour of the hill. 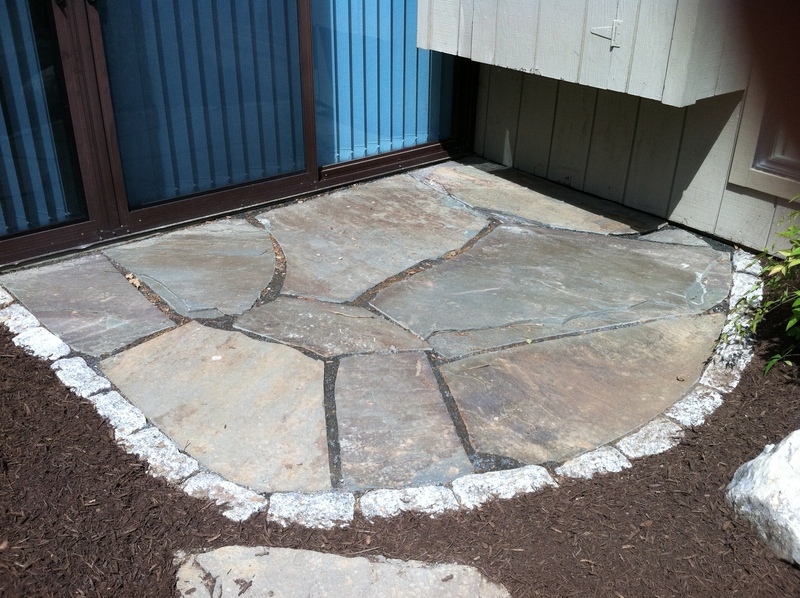 After removing the deck, a new stone patio with a curving front face to match the walls was built, covered with the same stone. 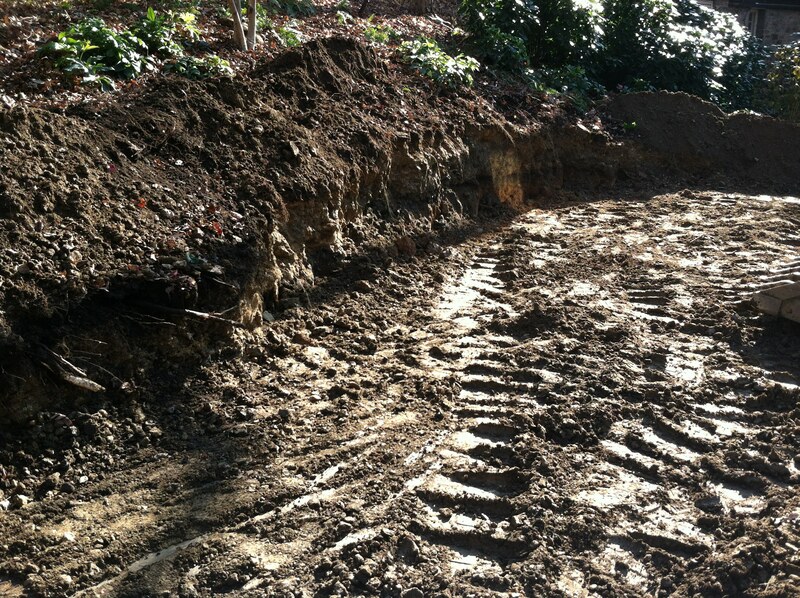 Carefully excavating around the existing large maple tree and keeping any extra soil away from the trunk was critical to maintain the health of the existing tree during construction. Changing the location of the steps from an awkward area on the left side of the original deck to an uninterrupted pathway that starts in the front yard cleaned up the traffic flow. Traffic flow, or the way you move around a property, is critical for pathway layout and convenience. Perennial plantings on either side of the steps gave added interest. This area was deer browsed, so plant selection was critical. 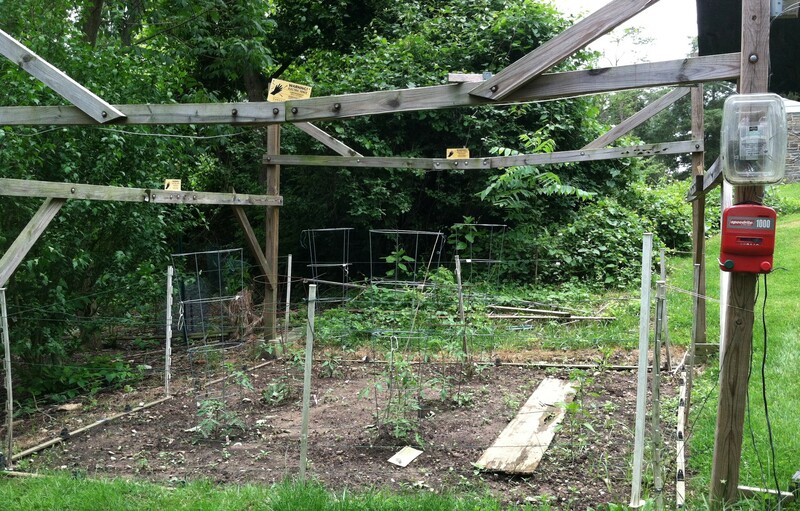 Go to http://thegardendiaries.blog/2014/06/06/deer-combat-using-deer-proof-plants-is-the-best-strategy/ to see a variety of plants that will work. 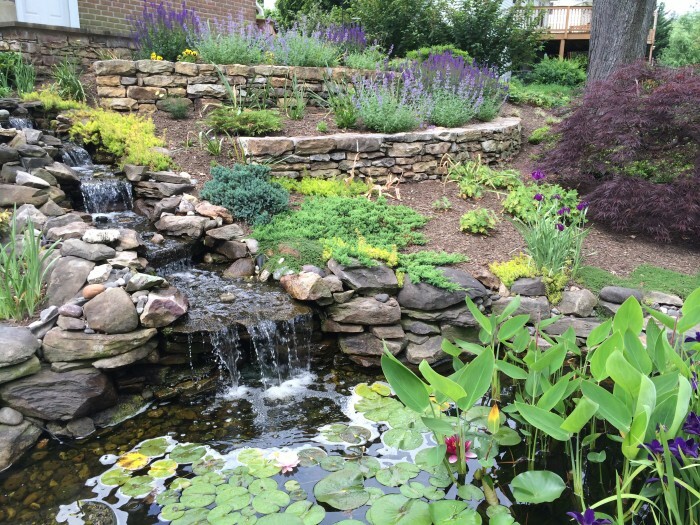 Installed with a black butyl liner, the pond and waterfall were built of fieldstone to match the walls. River jack, a rounded rock that is good for aquatic life, covered the bottom and hid the liner. Installation of an electrical outlet close by for the filter and pump, and convenient to the lower patio completed the pond set up. The original lower covered patio area was cracked cement and low concrete block walls. 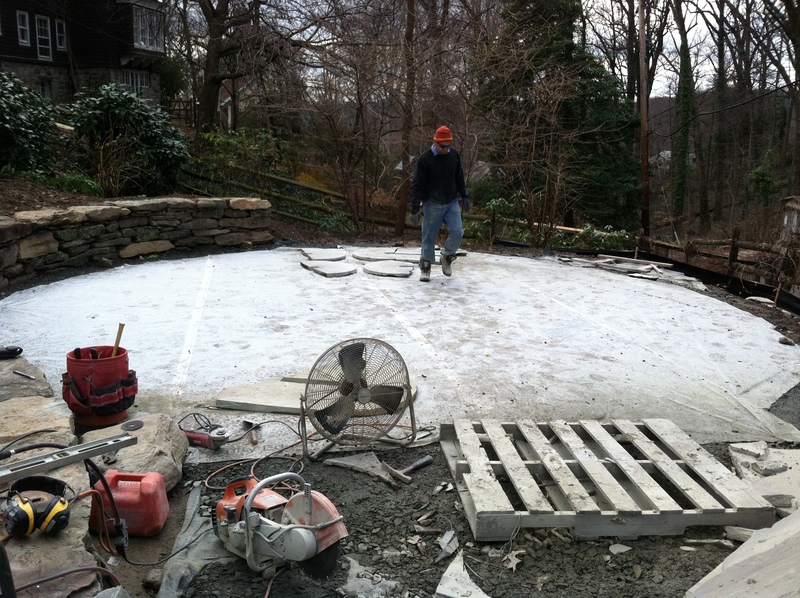 We covered everything in bluestone and Western Maryland stone to match the other walls below the upper patio. The walls became wide sitting walls, perfect for lounging on! To complete the transformation, the white wood work and supports were painted a fresh coat and the exterior of the house was given a parge coat in a color to match the stone. The finishing touch was installing a ceiling fan for a cooling breeze on a hot day. Now my client can sit comfortably on the upper or lower patio, or the conveniently placed bench and overlook the flowering plants, fish, and other wildlife that the flowers entice to the garden. Butterfly Bushes, Iris, Nepeta, Salvias, Creeping Junipers, Creeping Thyme, Geranium, Caryopteris, Ferns, Variegated Boxwood, Dianthus, Chrysogonum, and Hellebores were all used to give multi-season interest as well as being unappetizing to the deer population. I think when the Iris bloom is my favorite time to visit and take pictures. I have done lots of plant portraits on my blog and always mention if it is “deer proof” or not. As a designer, I am constantly updating – adding and subtracting plants from a mental list in my head that are reliably avoided by deer. 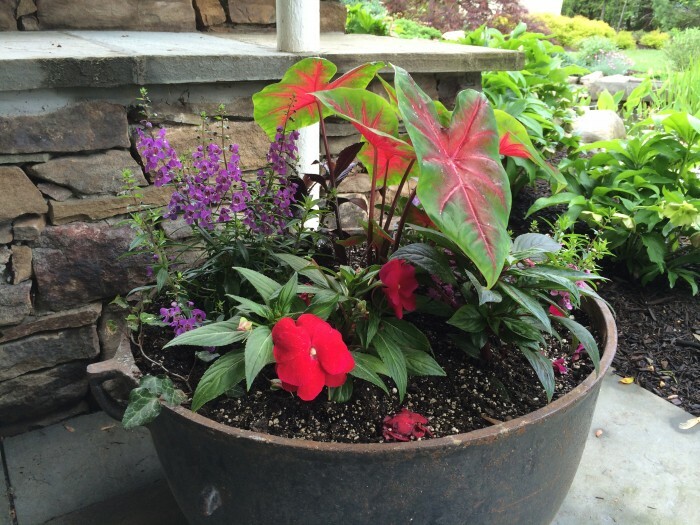 I don’t want to plant a perennial or shrub for a client that disappears in a day or a week. I want something that deer won’t even consider including in their daily buffet choices. 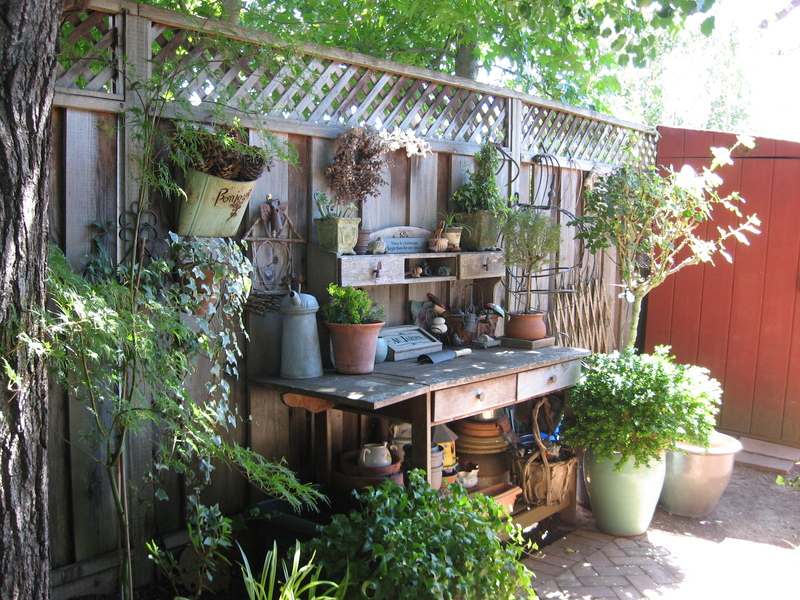 Consolidating some of my favorites in one post was my goal, so that someone who is planning a new garden or renovating a “deer torn zone” that they call their garden, will be able to use a variety of plants other than boxwood, daffodils, and plastic! Solutions for warding off the Bambi plague are legion. There are deer fences, deer sprays, deer gadgets such as water sprays, repellents, and ultrasonic solutions, which work sometimes, but deer get used to anything. Electric fences are the most effective but impractical for many people. Making the plant choices unappetizing and not on their menu, is really key to combat the deer problem, forcing them to search out greener pastures, like your neighbors! Deer tend to beat the same path through properties, so be aware of this and plant really unappetizing selections along these routes, avoiding attractive favorites like hostas, daylilies, and azaleas which attract deer for miles around. Because of fuzzy leaves, bitter taste, or strong fragrance, there are plants that deer universally will not touch. 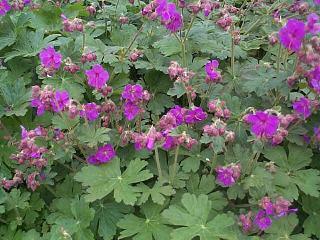 A few are obvious because of the pungency of the foliage and flowers, like lavender, catmint, and Big Root geraniums. Brushing against these plants releases a strong pungent odor which is your clue that deer will hate it! Deer proof for me simply means rarely touched, if ever. 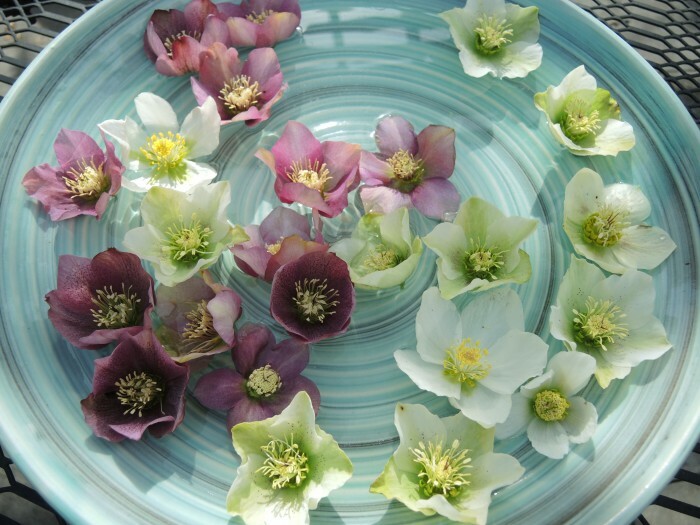 I have seen Hellebores nibbled on once or twice, but I think deer tried it and then rejected it as inedible. One choice that everyone should plant who have deer browsing are Hellebores. 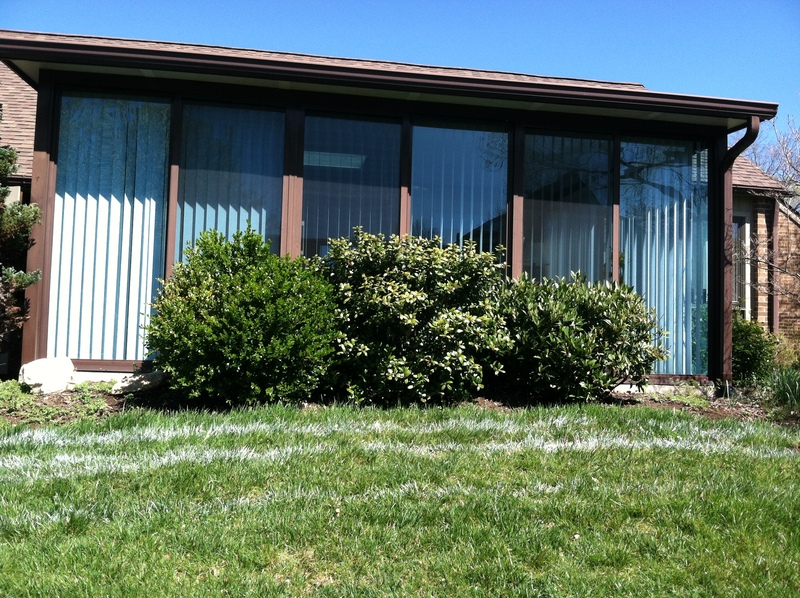 See more info at, What is Deer Resistant, Blooms in the Winter, and is Deer Resistant? . 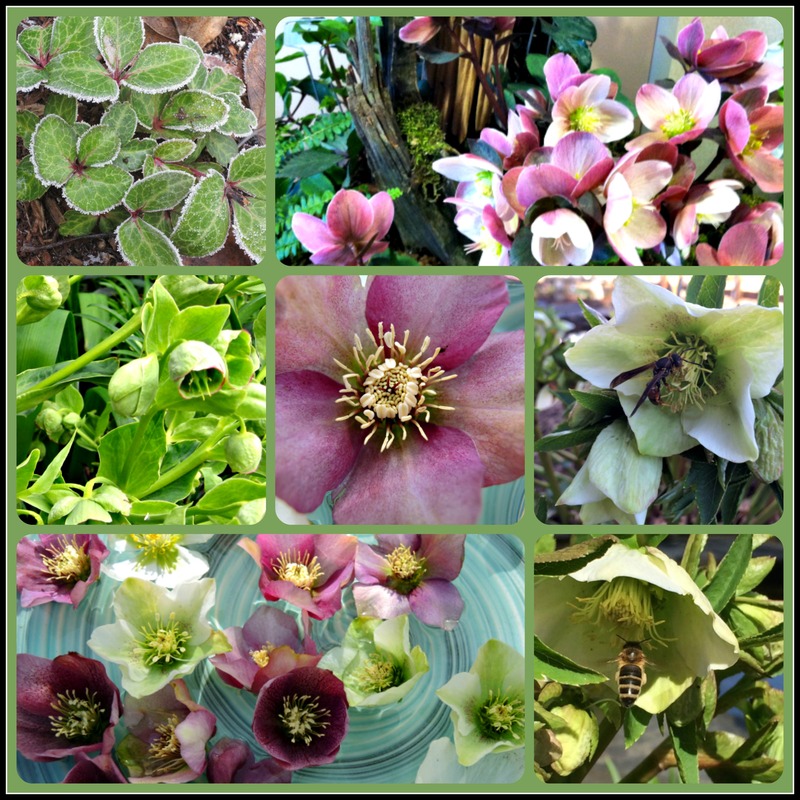 A tough shade loving perennial, a full stand of Hellebores will stop you in your tracks, and wow you with their beautiful blooms that can last for 4 months. A little pricey initially, these stalwart plants will repay you many times over the years for your investment. 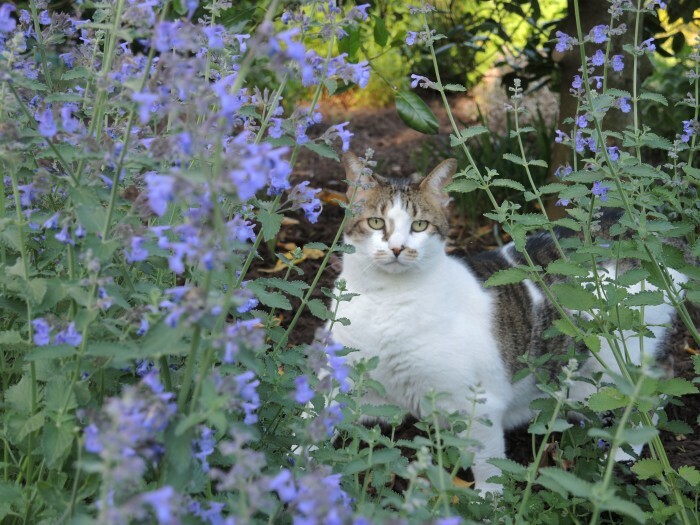 Catmint or Nepeta is a beautiful choice that I have found universally rejected by deer, but loved by cats. 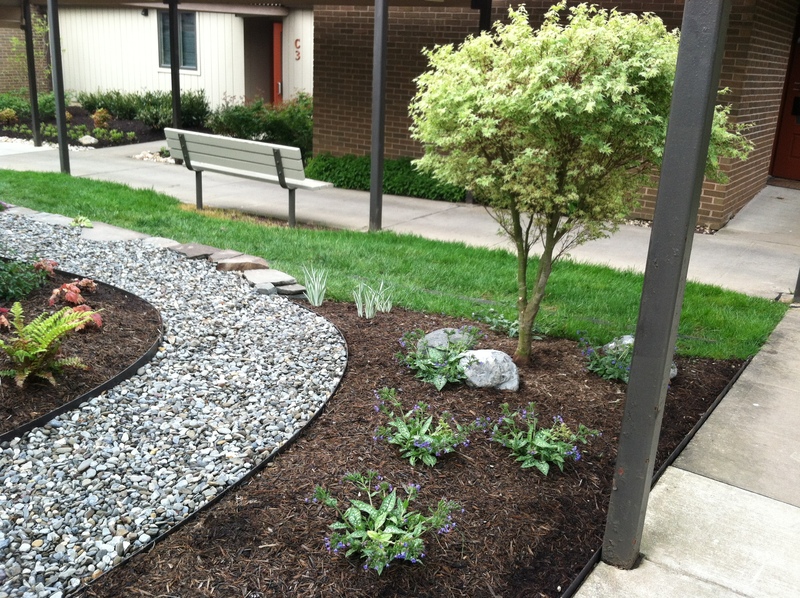 It is a great edger, reliably comes back every year and is drought tolerant. Blooming prolifically for weeks, a cut back in midsummer will begin a new round of fresh blooms until frost. This is an unsung hero of perennials! And don’t worry that hordes of cats will descend on you. I have found my cat visits this plant only occasionally. Fuzziness or hairy leaves is also a big indicator of a deer repellent plant. 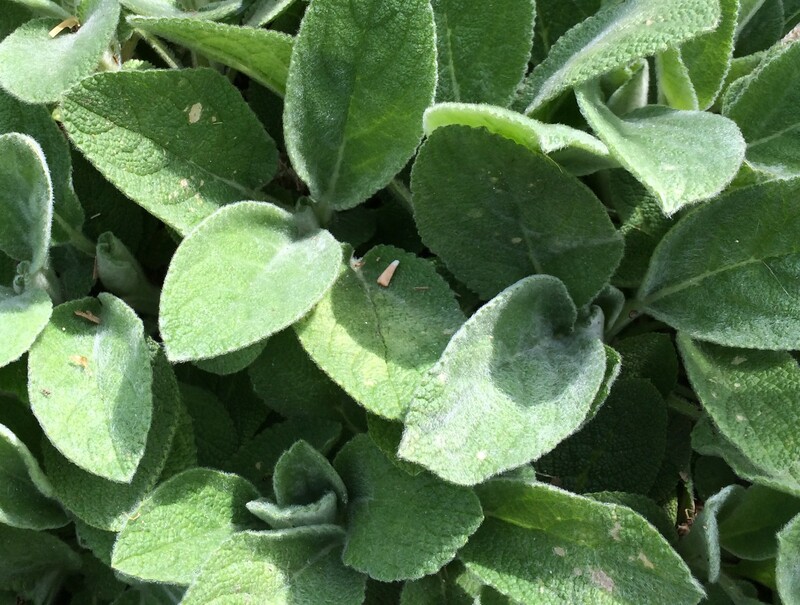 Just consider Lambs Ears, the softest wooliest leaf, almost like a cashmere blanket, and deer will spurn this totally. On the other end of the spectrum, deer regularly browse on hollies and roses, the prickliest plants in my garden. Go figure!! Salvias are my go-to plant for deer infested areas. 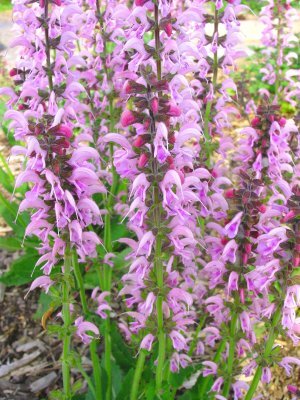 Another strong fragrance plant that deer disdain, salvias are a diverse group of plants that bloom for weeks and weeks during the summer, so you could plant just salvias in your garden and get bloom all season long in a spectrum of luscious colors. Check out my post on Salvia Amistad to see great selections. Agastache or Anise Hyssops are gaining in popularity because of the staying power of the blooms- about 3 months, and the attractant power for pollinators. 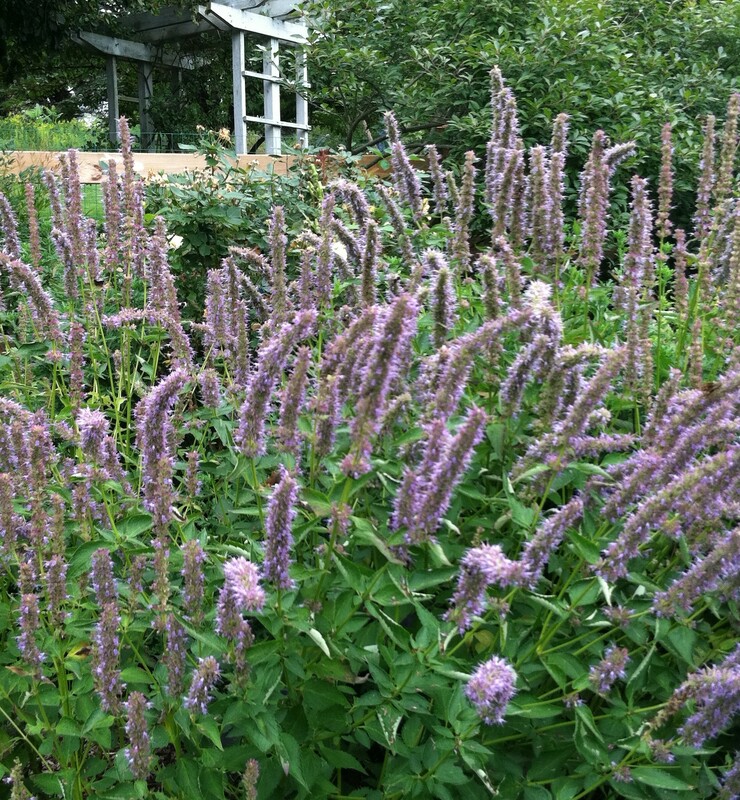 Just stand by an Agastache in full bloom and you will notice a cloud of insects covering the blooms. Hybridizers are coming out with a new palette of colors, like yellow, oranges and reds, but I find that the old stand-by ‘Blue Fortune’, is the most reliable. 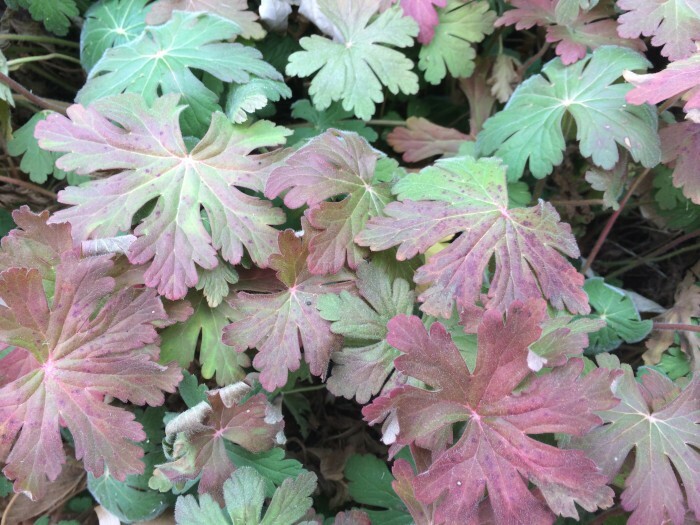 Named because of the large fleshy roots that hold the foliage up, this extremely fragrant ground cover, Geranium macrorhizzum, thrives in all kind of conditions – sun, shade, wet, and dry. It is a very tough plant that blooms with nodding flowers in spring, and turns a russet color in the fall. In mild winters the foliage will remain, shrinking down a bit, but remaining for most of the winter. 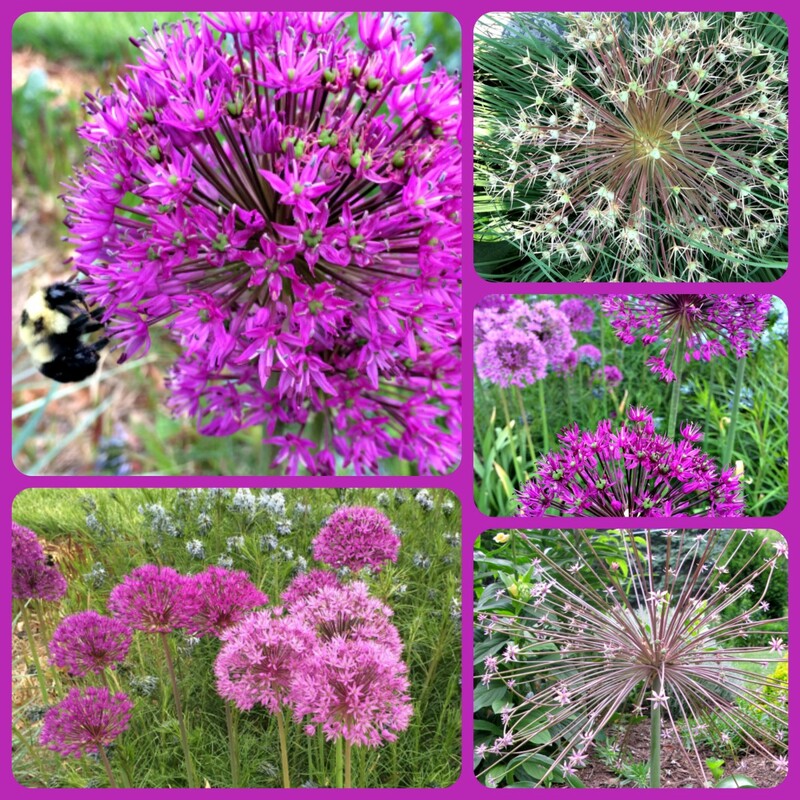 In the onion family, Alliums are perennial bulbs known for their star like flowers that are quite spectacular. Easy to grow as accent plants, the seed heads are useful for dried arrangements. Looking for a stellar edging perennial with evergreen blue-green foliage that is covered in bright pink flowers for weeks? Dianthus is your plant! 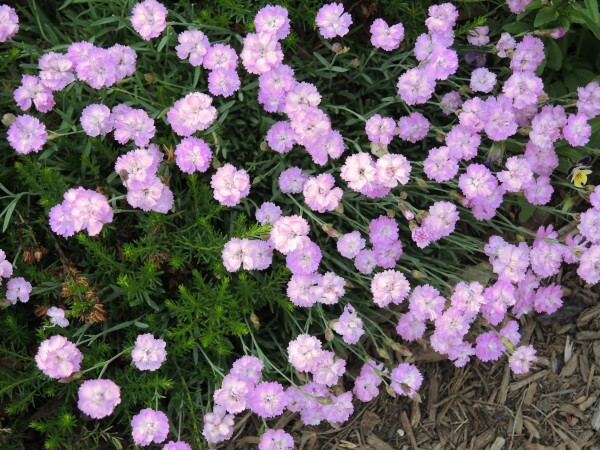 Not many perennials have evergreen foliage, and dianthus is one of the best. Easy to grow and easy to split up and move around. Buy just a couple and end up with many. 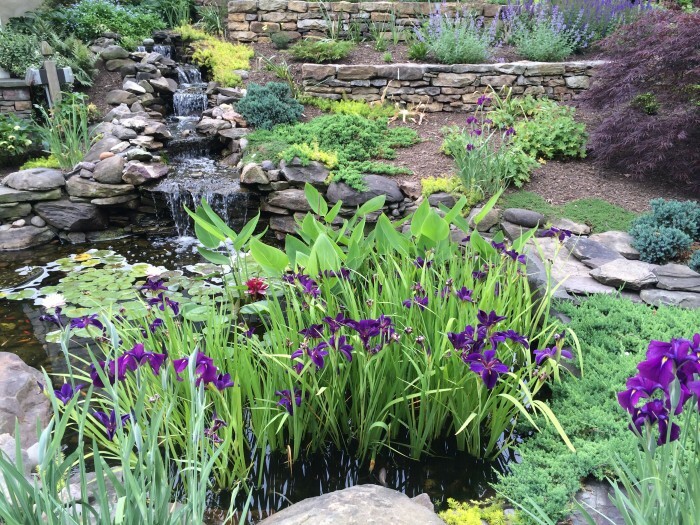 When I am looking for a plant to give some vertical height in a garden, that is tough and attractive even when not in bloom, I turn to the Iris family. 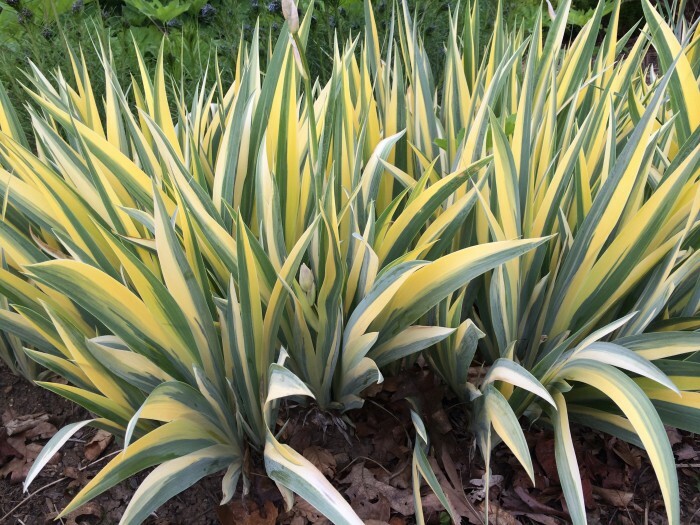 The variegated form is a bonus, striking gold-toned foliage! 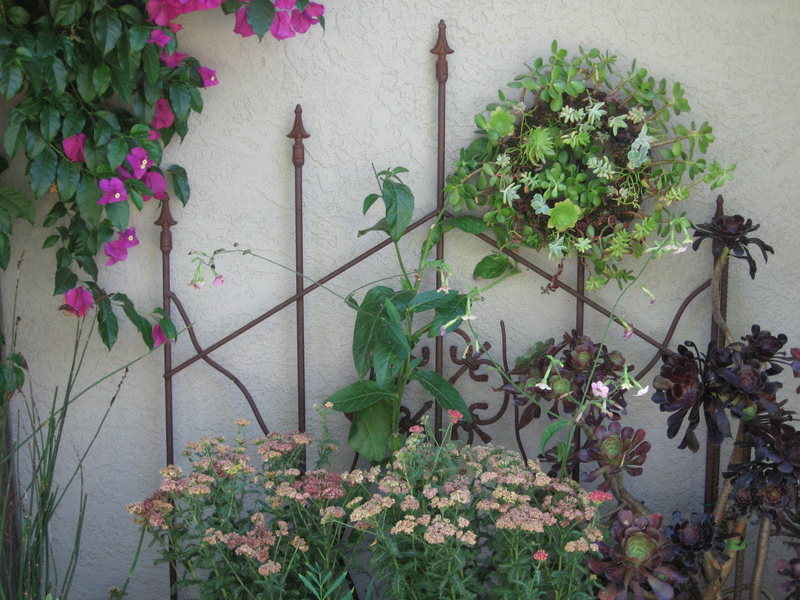 If you are on Pinterest, go to my board of deer resistant plants. 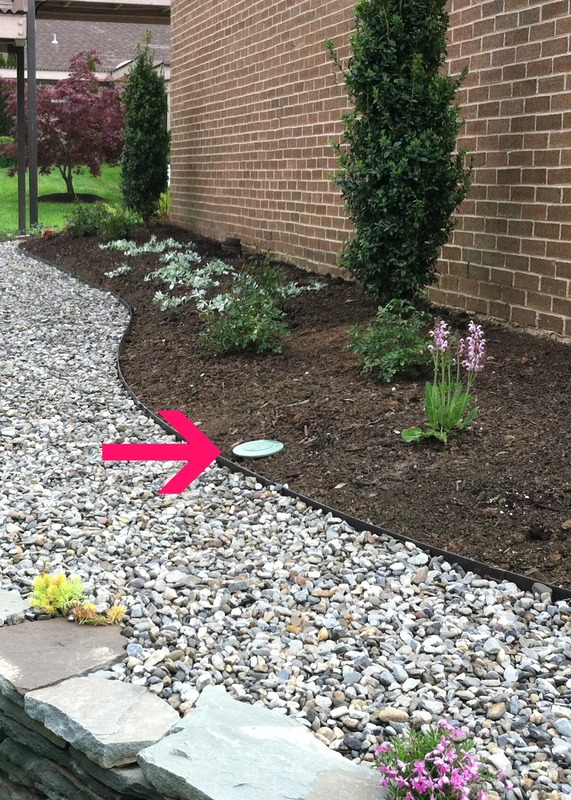 Here are further examples of beautiful perennials that deer avoid. 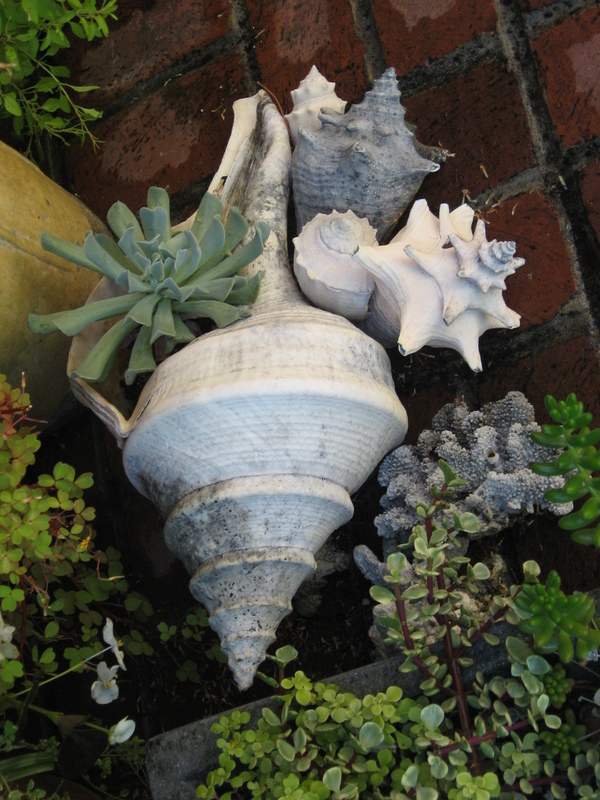 Take your pick for a beautiful garden! 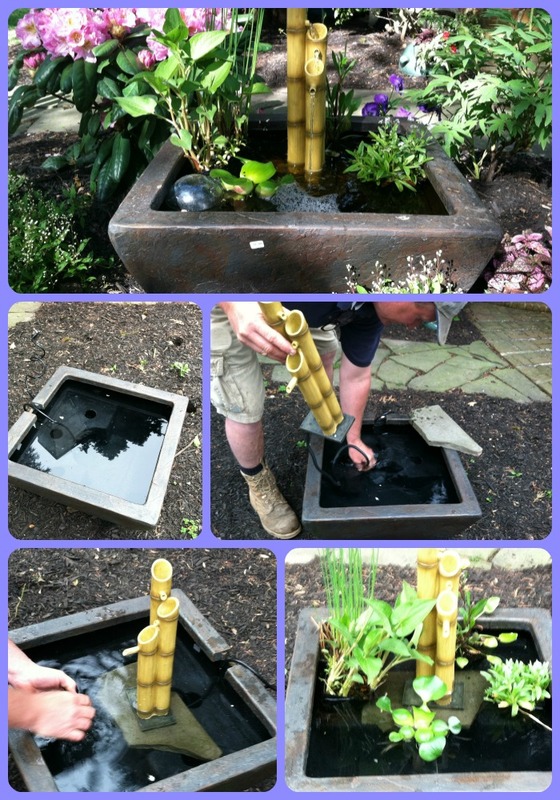 Installing a simple re-circulating fountain is a DIY project for anyone. Even with my total lack of mechanical knowledge, it became a snap to set this up. 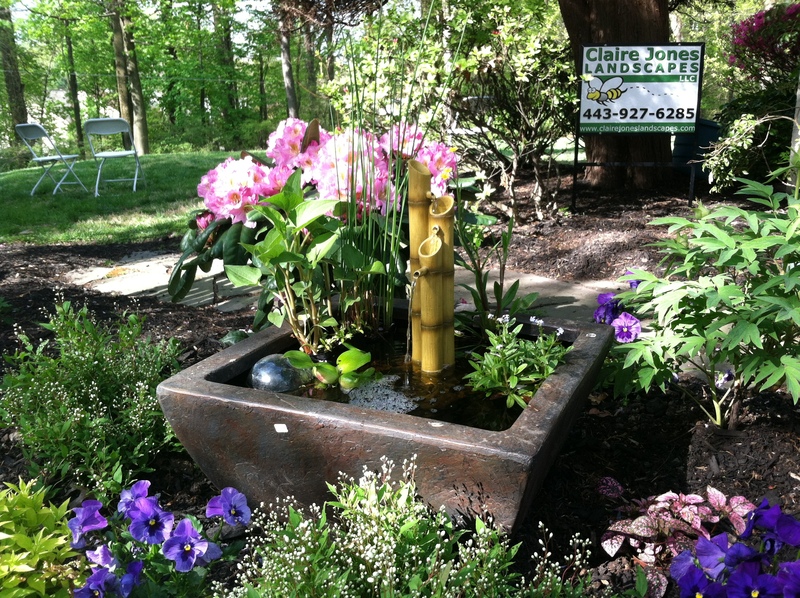 Creating a warm and inviting outdoor living space at the local decorator show house this spring, made it clear how easy and effective a fountain set up can work in the landscape. 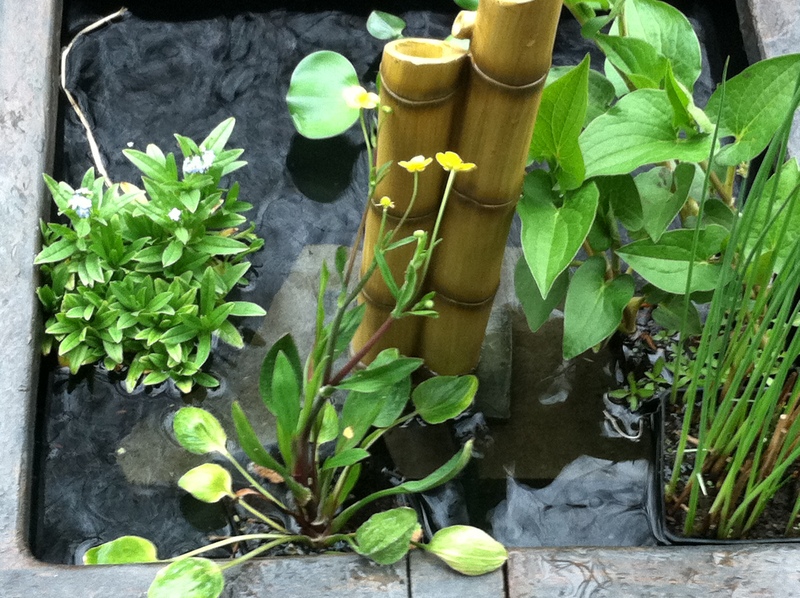 I bought everything at a local garden center – reservoir, pump, tubing, bamboo fountain, and water plants, and put it together in a few minutes. 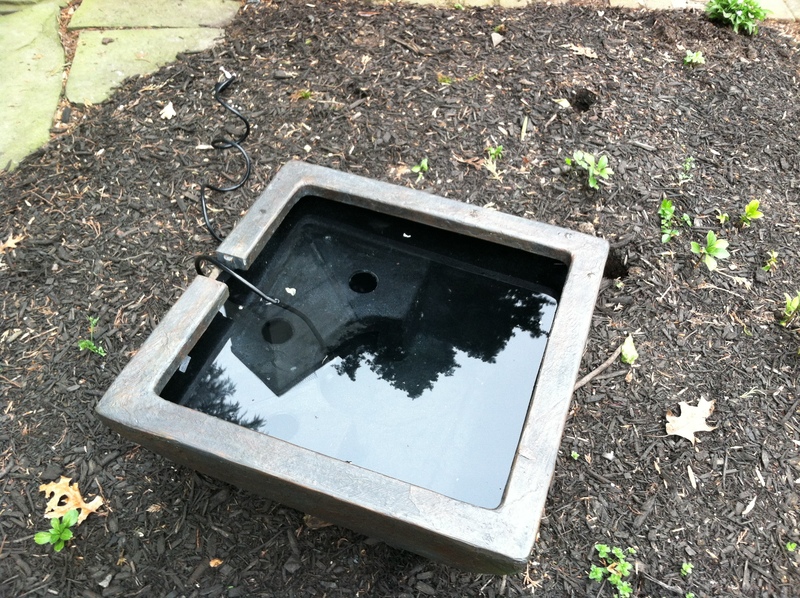 After I planted shrubs and perennials around it, the fountain looked grounded and like it belonged there. 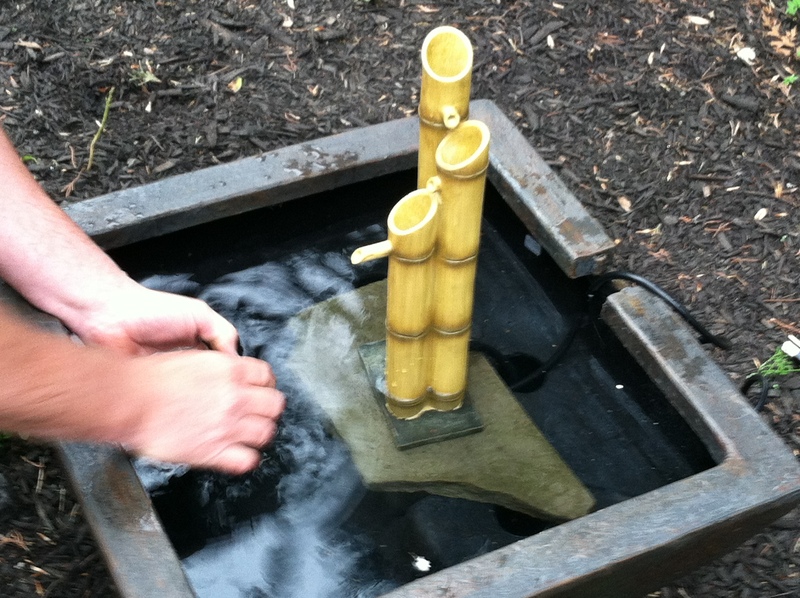 The faux bamboo cascading fountain came as part of the package with the reservoir, and became a three-tiered cascading waterfall into the reservoir that created a nice relaxing water movement sound. The only maintenance involved was pulling out fallen leaves occasionally, and topping off the water level once a week lost from evaporation. Cleaning is only necessary once a year. The constant running of the water will eliminate any mosquito breeding. Fish would not be happy in this environment, as there is not enough room to swim. The cost for the fountain, plants, pump, tubing, etc. came up to about $350, which I consider very reasonable. The water cascading out of the bamboo creates a soothing water trickling sound, which makes any water feature worth its weight in gold. 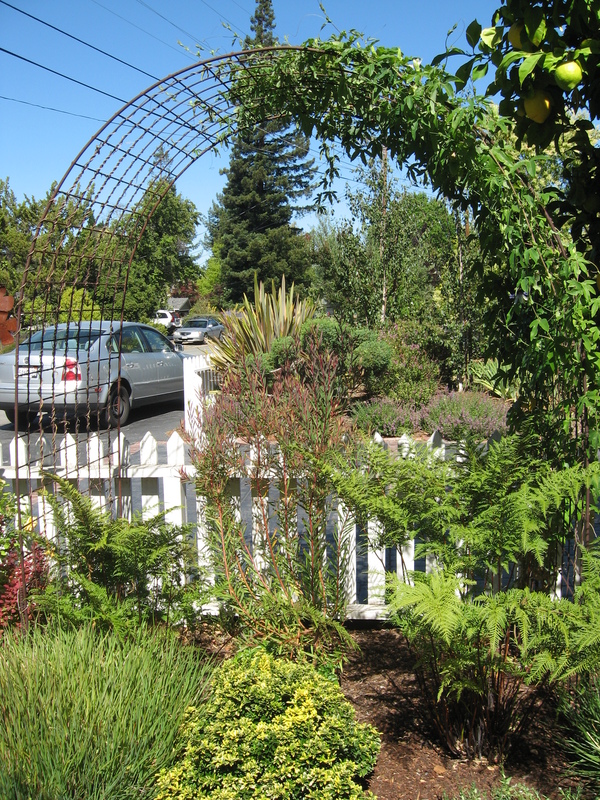 On my recent trip to San Francisco for the garden bloggers “fling” when we visited Rebecca Sweet’s beautiful garden, what struck me about her design strategy was “garden vignettes”, “design spotlights”, and “skinny spaces”. 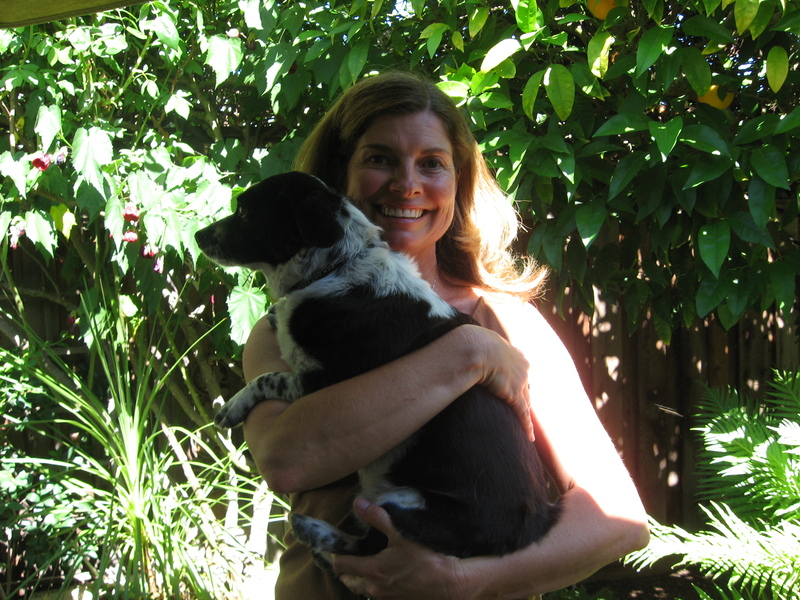 Rebecca Sweet is an innovative garden designer who lives in northern California and wrote “Garden Up-Smart Vertical Gardening for Small and Large Spaces”. And she certainly uses every vertical space available! 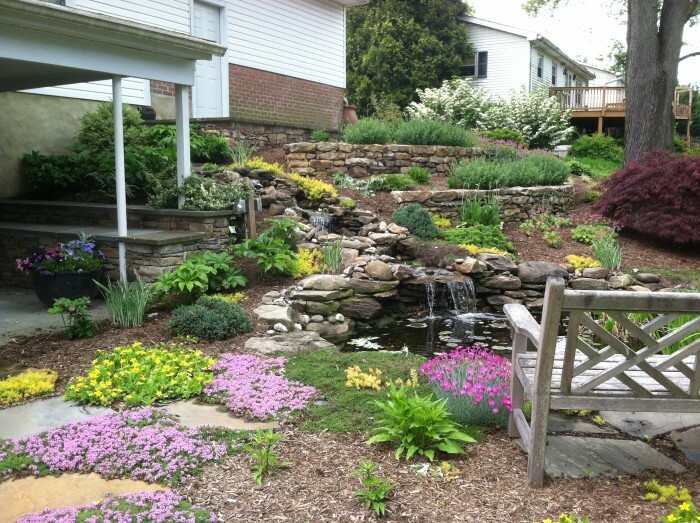 What makes a garden personal and a reflection of you? Think of decorating your interior space when you put personal collectibles or mementoes from travels on your end tables or shelves. You create little vignettes of items that go together to make a statement and express what you enjoy. Well, that is what drew me to Rebecca Sweet’s garden in San Francisco. 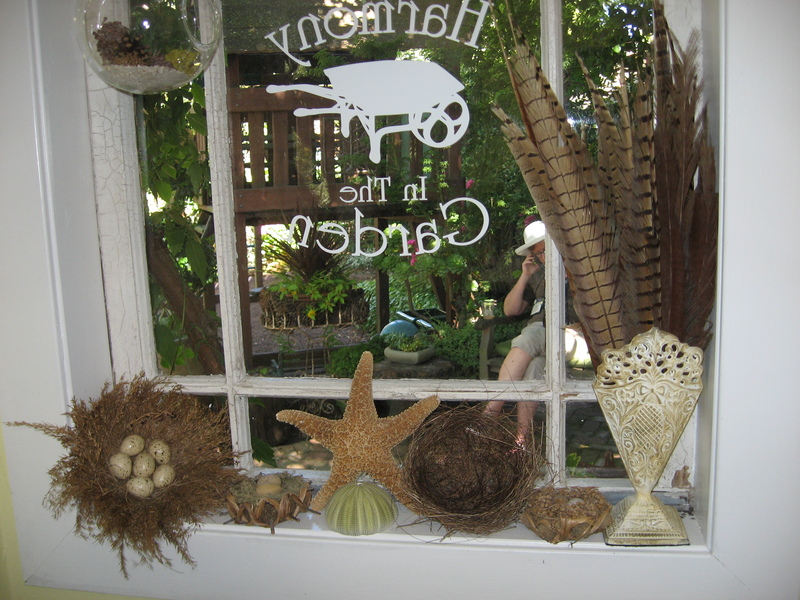 She had a small to medium garden, but every time you went around a corner or entered a new space, you stopped to look at the small collection of objects that she had arranged to express a feeling, experience, or set the stage. So, even though the square footage wasn’t large, the good use of space, both horizontal and vertical enhanced the garden space and it took a long time to take everything in. 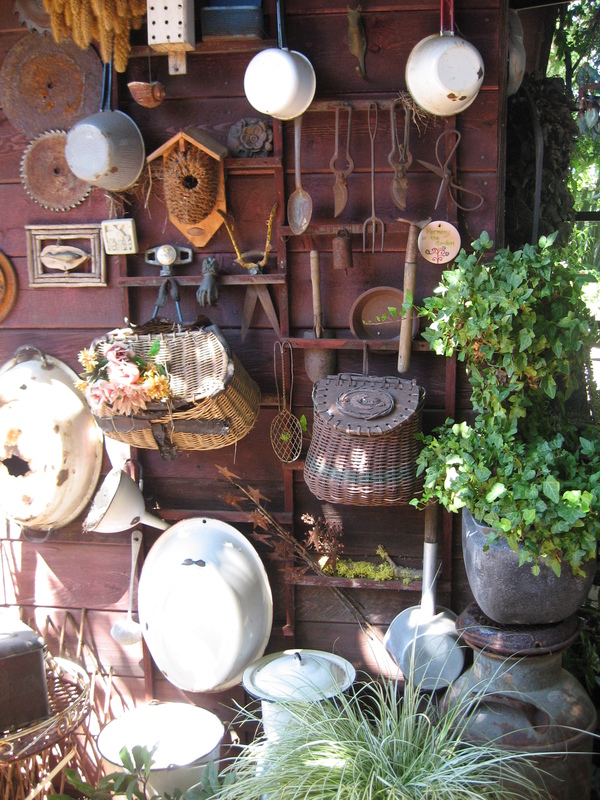 The visit inspired me to visit my local salvage yard to pursue some “finds” to enhance my outdoor space. Some people would call it clutter, but each piece looked like it was carefully selected and displayed. Call it a museum of garden “stuff”, in a painterly style. 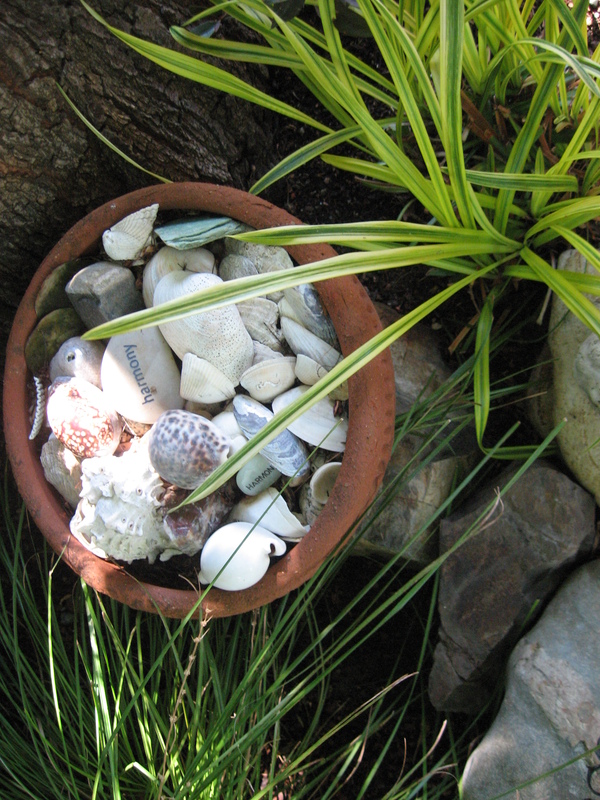 Clustering and collections were used throughout the garden just like you would decorate your house. 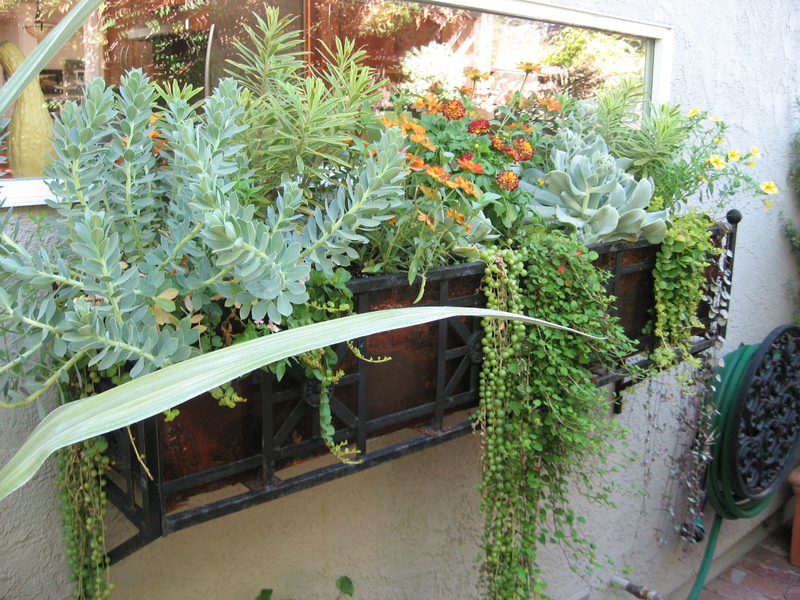 A heavy use of succulents and agaves was very noticeable, but we are in California where these things thrive! 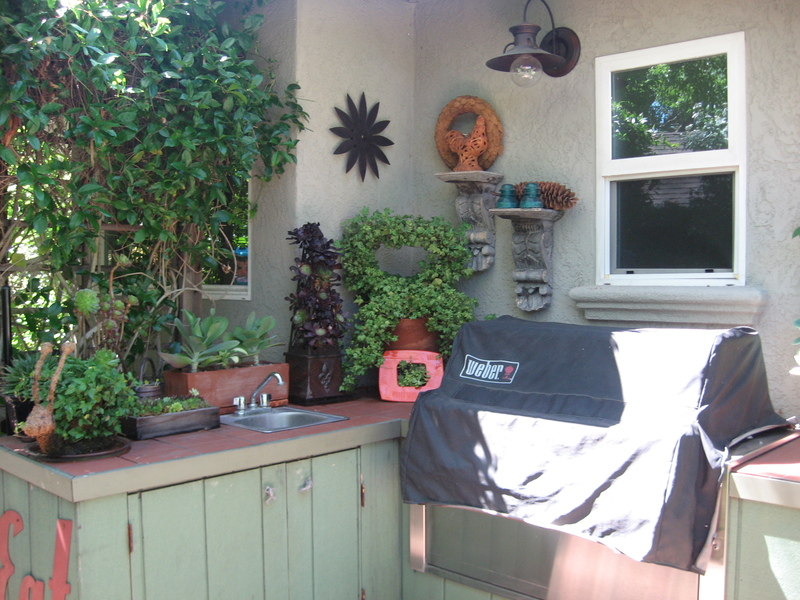 I call this kind of design California Fusion, with a layered and lush approach to design. No space was left untouched. 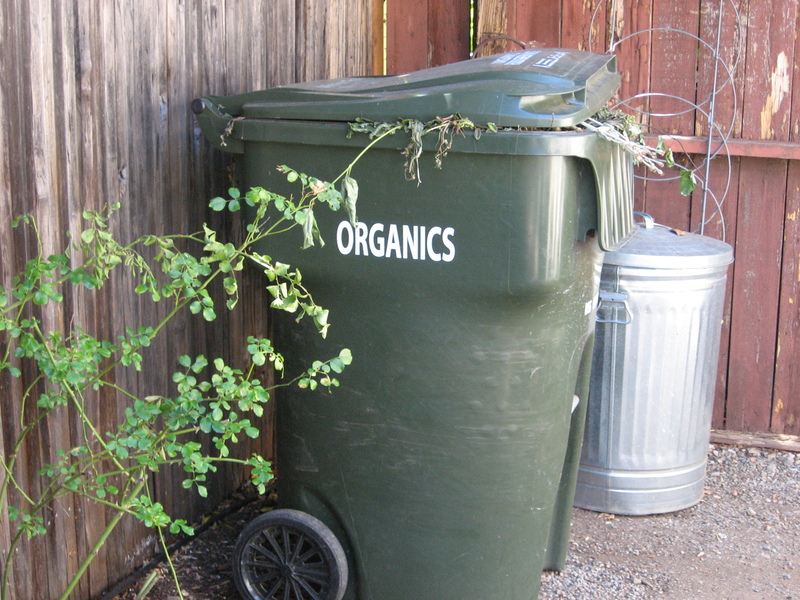 Even behind the shed, the trash recycling area, and the kids play area, usually neglected areas, was thoughtfully designed. Under the play set was an entire miniature world! Rebecca Sweet was a very gracious hostess as well as her dog who was a rescue “Borgi”, a cross between a Border Collie and Corgi. Sometimes as a designer, a dream job drops into your lap! That happened recently with creating a labyrinth space for a client. I have always wanted to install a labyrinth and had designed one for a previous client but because of cost, the job fell through. 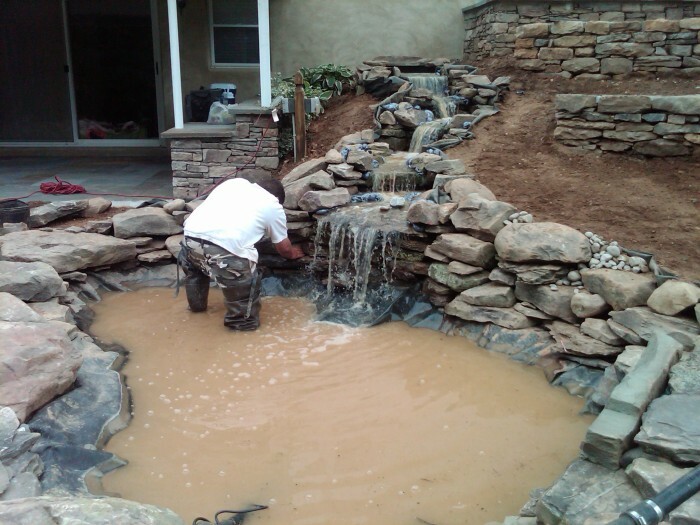 For that client, I went on to do a fabulous installation of waterfalls, ponds, and terraces, but the labyrinth was not to be. 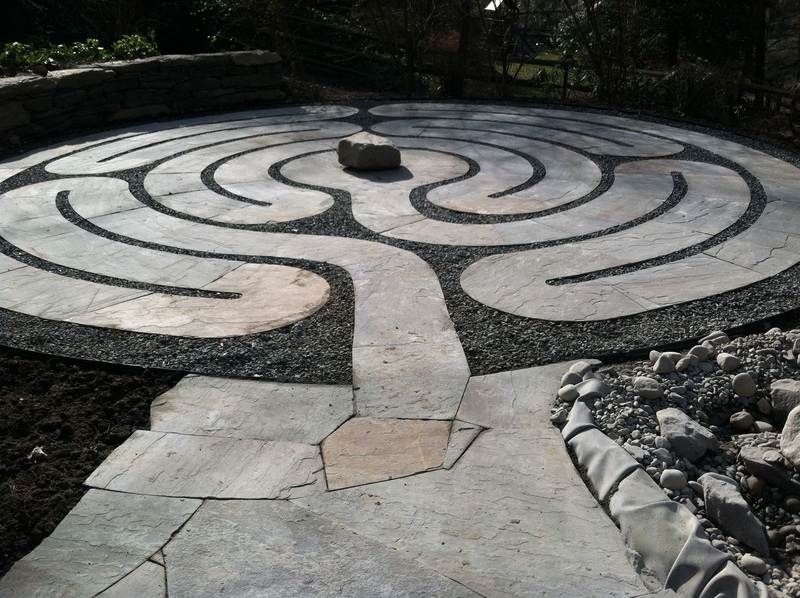 Here finally, was my chance to design and install a labyrinth! 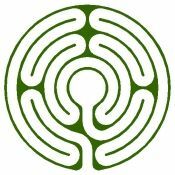 My current client requested a space to help with the healing process of losing a son, which started me on a journey of learning all about the lore of labyrinths, which I found have been in existence for thousands of years. Patterns for labyrinths have been found on old tablets and pottery dating back to 4000 BC, and this ancient pattern is found in many cultures around the world. It is said that labyrinths mimic the spirals of nature. A labyrinth is often looked upon as a womb – a place of safety and rejuvenation. It is seen as a place for the birthing of inspiration, understanding and creativity. In Greek mythology, the Labyrinth was an elaborate structure designed and built by the legendary artificer Daedalus for King Minos of Crete at Knossos. Its function was to hold the Minotaur, a mythical creature that was half man and half bull and was eventually killed by the Athenian hero Theseus. Daedalus had so cunningly made the Labyrinth that he could barely escape it after he built it. Theseus was aided by Ariadne, who provided him with a skein of thread, so he could find his way out again. Labyrinth is generally synonymous with maze, but there is a distinction between the two: maze refers to a complex branching puzzle with choices of path and direction; while a single-path labyrinth has only a single, non-branching path, which winds to the center. A labyrinth has an unambiguous route to the core and is not designed to be difficult to navigate. It is all about the journey to the center of the labyrinth and a traveler is to walk it with intent and purpose. The path taken is for personal, psychological, and spiritual transformation. To start your journey, a visit to the Heart Space which is the entrance to the labyrinth, is the first stop. 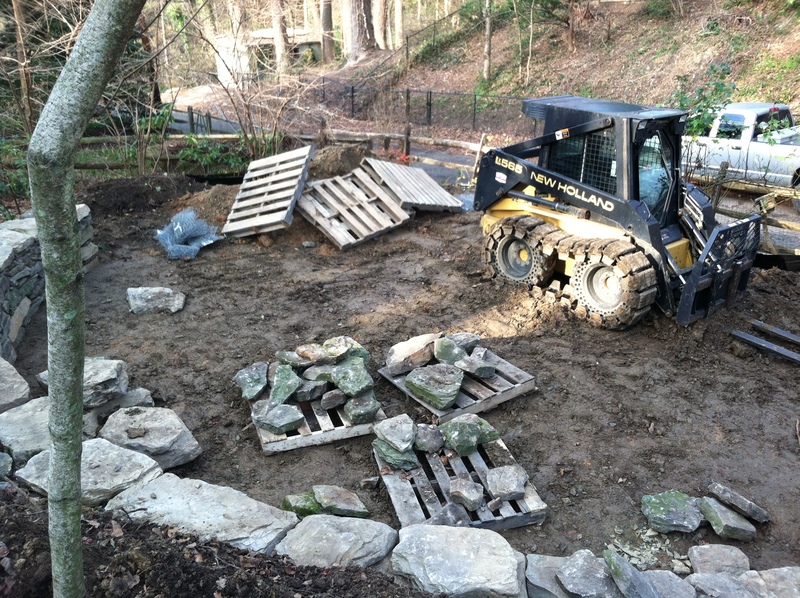 I designed this as an antechamber to the main labyrinth with a small boulder water feature. 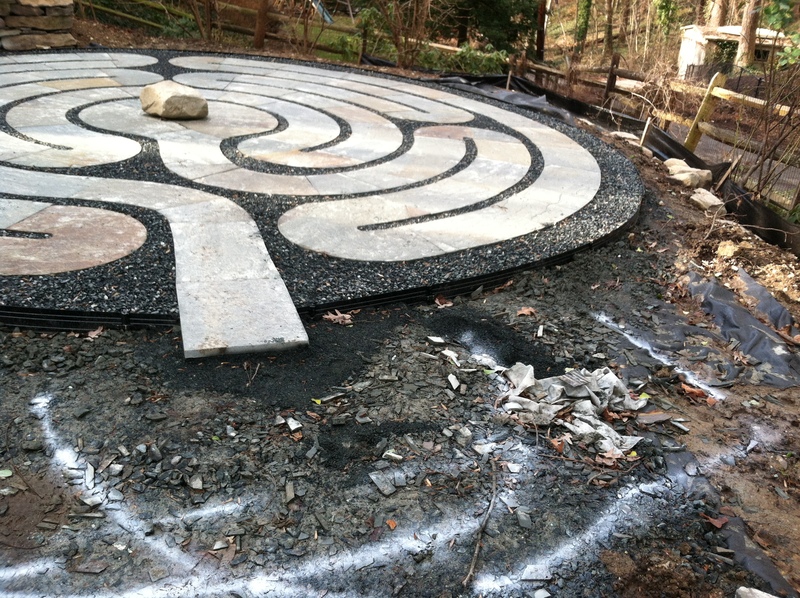 The Heart Space may be used for the placement of any symbol that may enhance the spiritual use of the labyrinth. As a walker, you could dip your hand in the water to start the journey. To break the walker’s journey, I wanted a perching boulder that you could rest on. I looked for the perfect size and shape to place in the center. I didn’t want the boulder to be too large and over power the space which was 5 feet in diameter, but wanted something to enhance the journey. 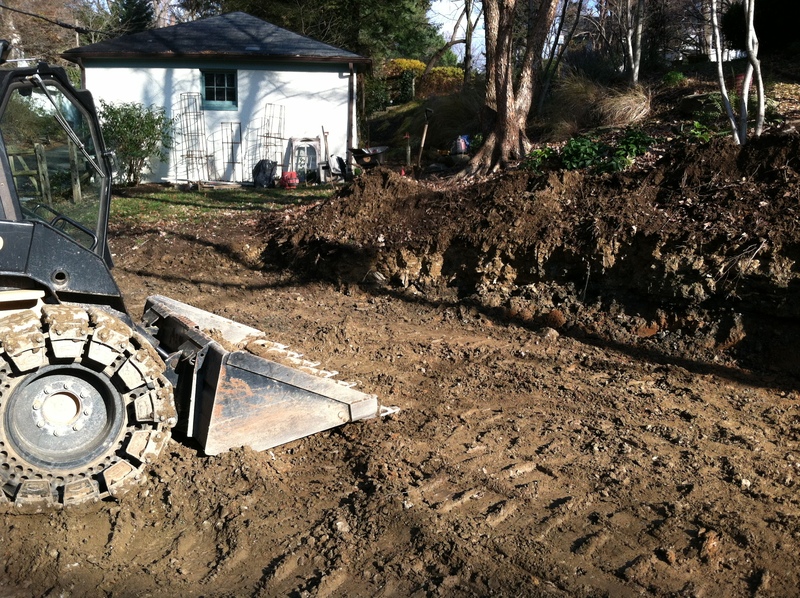 Since the site was sloping, I knew that a retaining wall had to be built into the hillside to hold the slope, and the entire area had to graded flat with a very slight incline towards the lane for drainage. With these parameters in mind, I measured the space that would accommodate a deceptively simple design that utilized the space available. Also large field stone steps would have to be placed in the hillside from the upper area down to the labyrinth. I chose a cruciform design (turns in each quadrant), or a Contemporary Medieval design, which is a simplified version of the Chartres Labyrinth found at Chartres Cathedral in Paris. Old examples of these Medieval designs are found on the floors of Cathedrals of Europe. 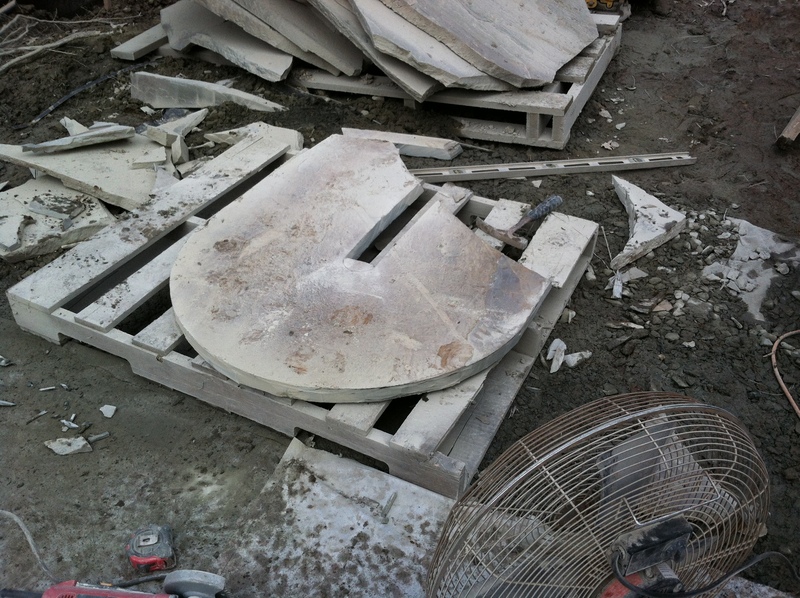 I ordered a template of white landscape cloth online as the design had to be installed precisely in stone. 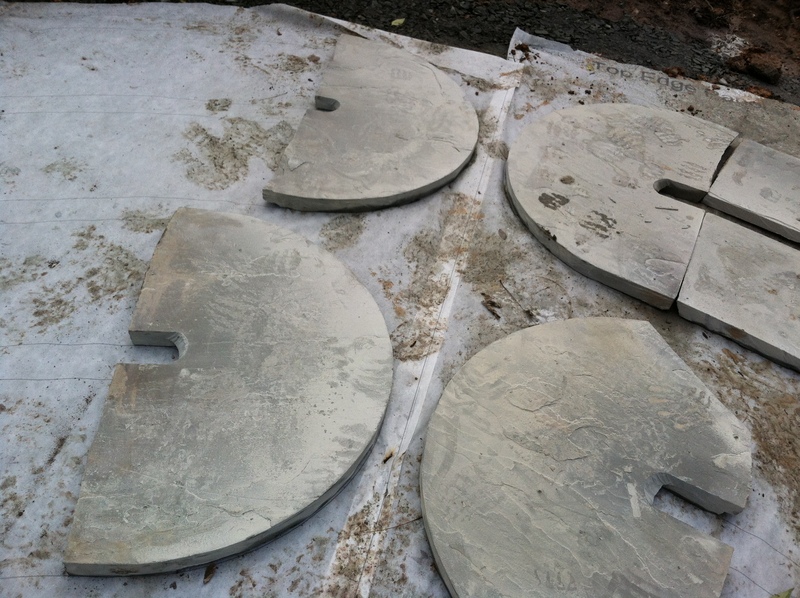 I looked at many materials when planning the design but ultimately decided on one of my favorites, Bluestone. Sandstone was considered, but ultimately because of its habit of shedding layers since it is a soft stone, I discarded the idea of using it. Some labyrinths are made of turf set with stone, but already having known and taken care of this kind of labyrinth, eliminated this because of high maintenance. I just remember the weeds over growing the lines and the maintenance of always clearing them off. 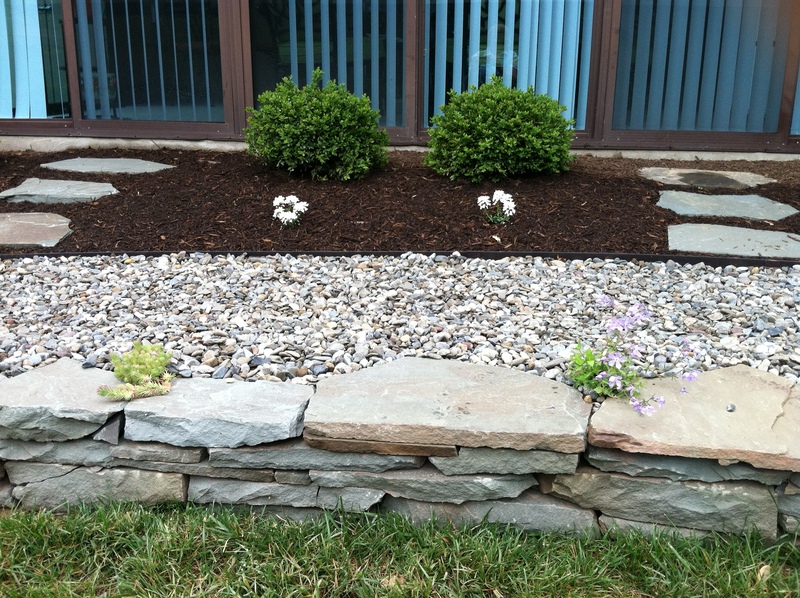 For the walls and steps, Pennsylvania Field Stone is a natural fit and goes well together. 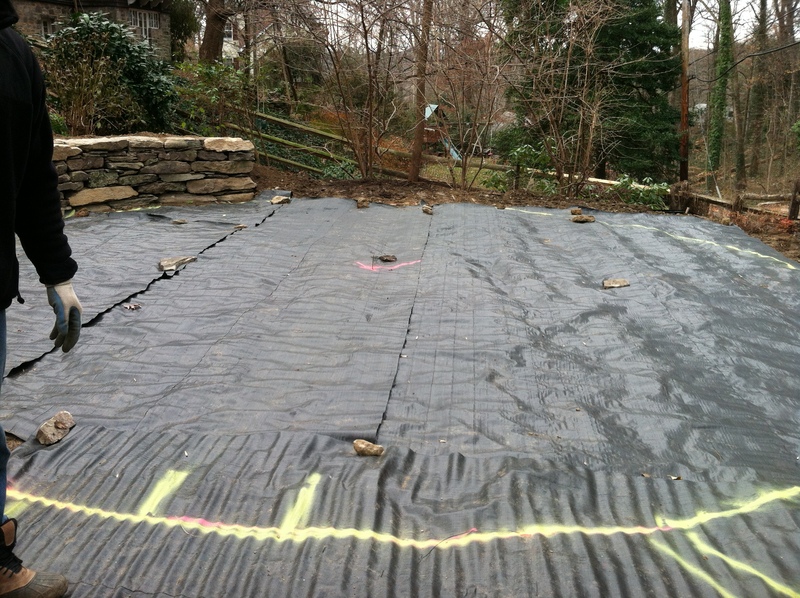 Once the materials were chosen, we were ready to break ground and hope the weather held out in November and December. 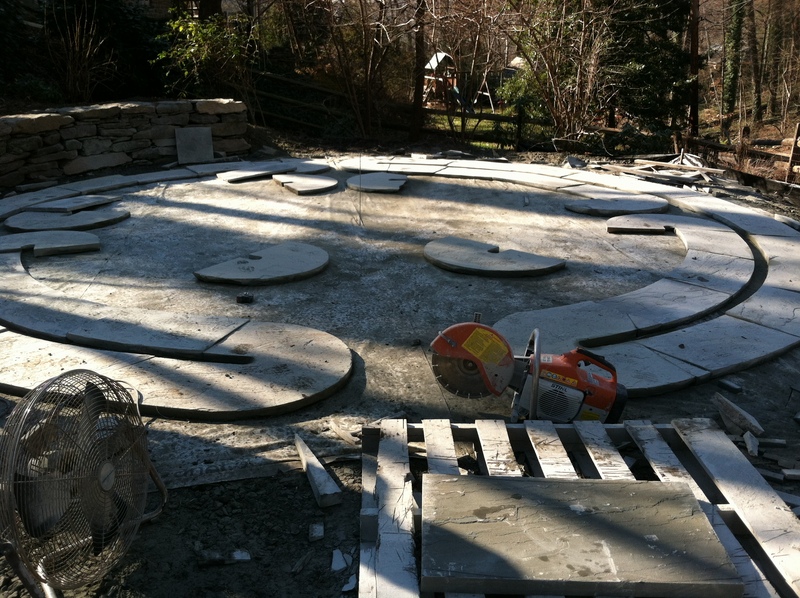 Next up – Installing the Labyrinth! 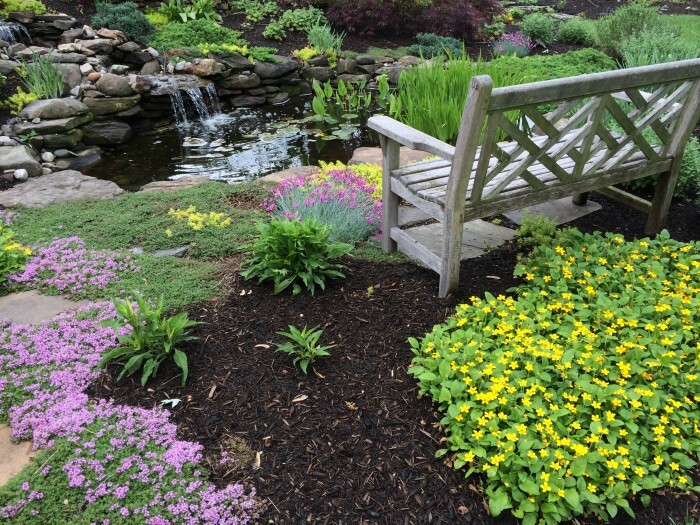 What do you do when you move from a large beautifully landscaped property that is overflowing with texture and color, to a retirement community that is populated with yews and swaths of mint? Oh, and did I mention overrun with deer? That was the tall order that I as the landscape designer had to deal with. 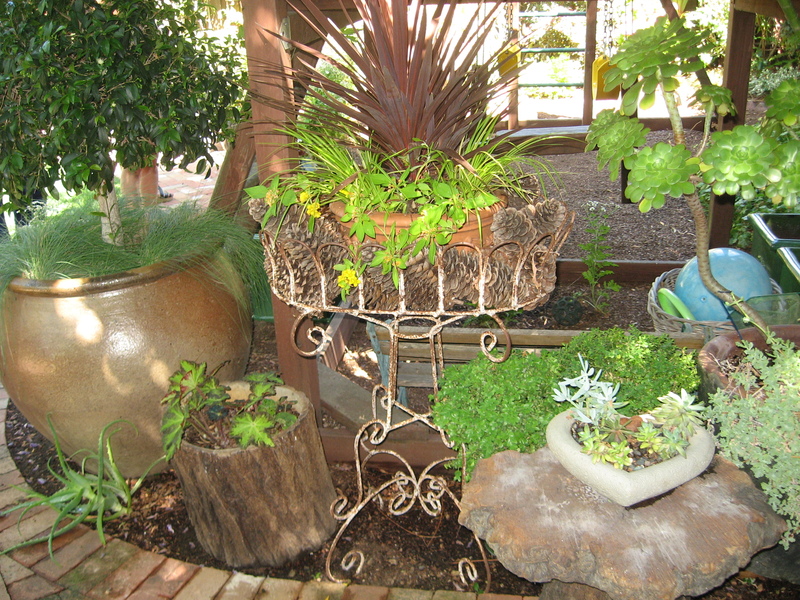 My client was an enthusiastic and knowledgeable gardener so she wouldn’t be satisfied with ordinary plantings. She wanted unique, colorful, and scaled down – but beautiful. 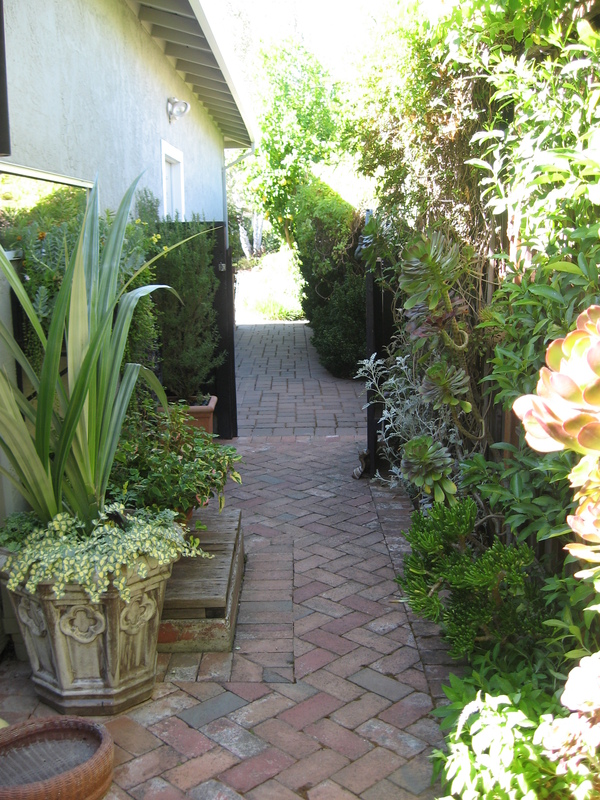 Also, she wanted a pathway to be able to walk around the entire property which was sloping, so that she could enjoy the plantings. The unit was large but the limitation was we could only extend out from the walls six to eight feet around the perimeter! 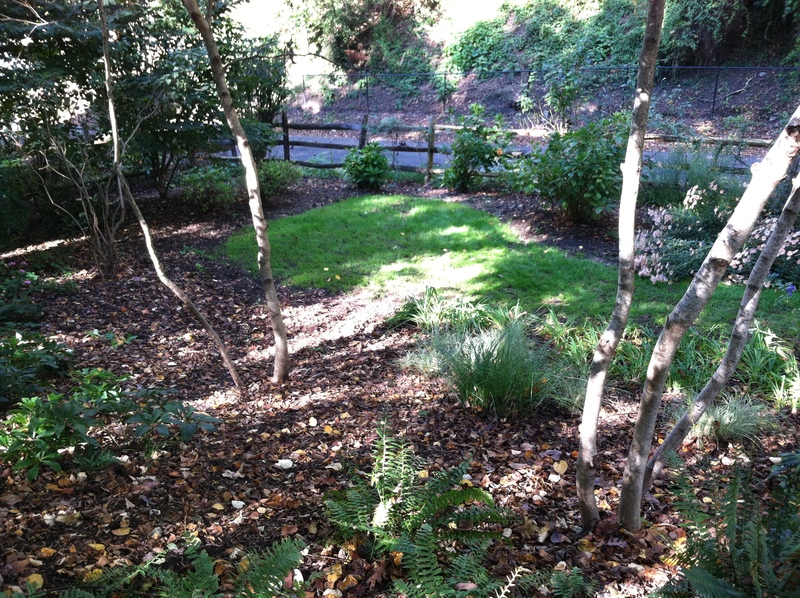 And the existing plantings were the usual suspects – yews, hollies, runaway mint, and overgrown trees. Any plantings that were installed had to be small in stature in ultimate height and breadth, but also imposing enough to make a statement upon first installation. 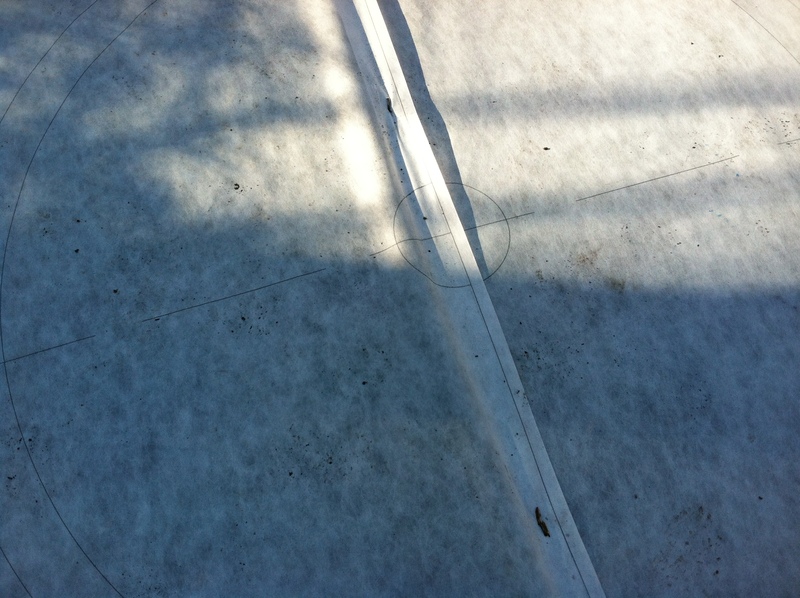 The drain pipe consisted of black corrugated above ground short lengths, that were visible and unsightly. Those were my challenges when I started to design a workable plan. 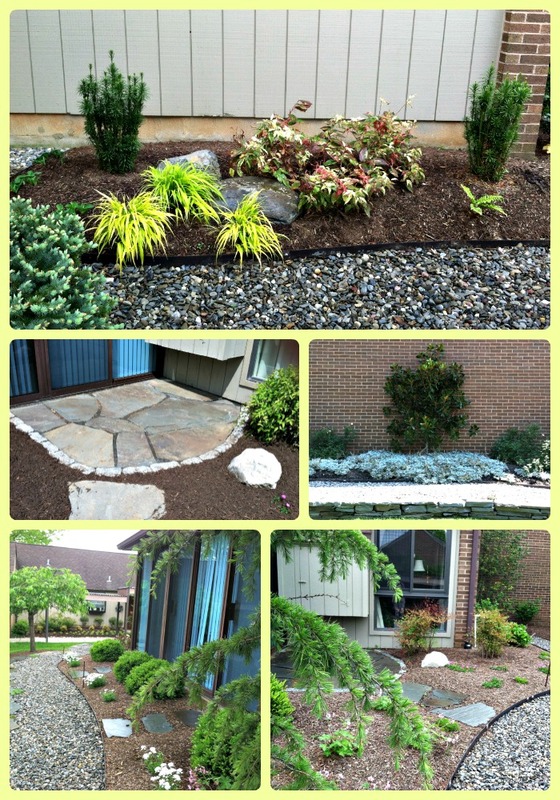 We started by tearing out most of the overgrown shrubs and trees and then we began the transformation. 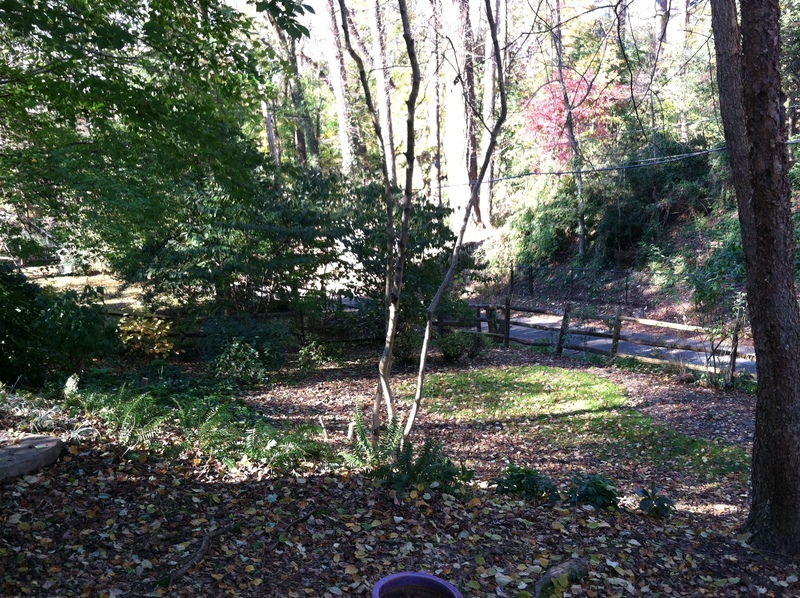 The view out the back door with hollies blocking the sliding doors. I am painting the lines for the wall and pathway in white. Because of the sloping site, a wall was required to level the grade around most of the unit. 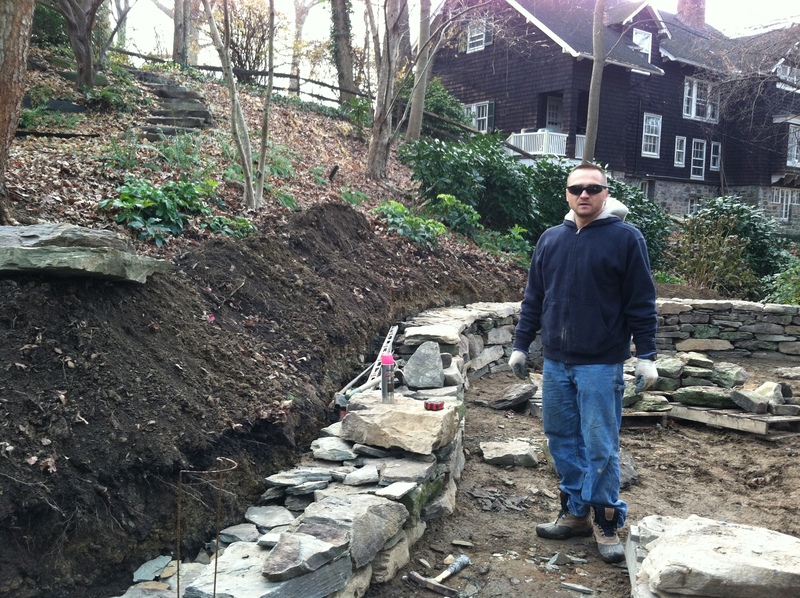 The finished height of the wall ultimately was only about 15 inches, but was mandatory so that my client could safely navigate the sloping terrain. 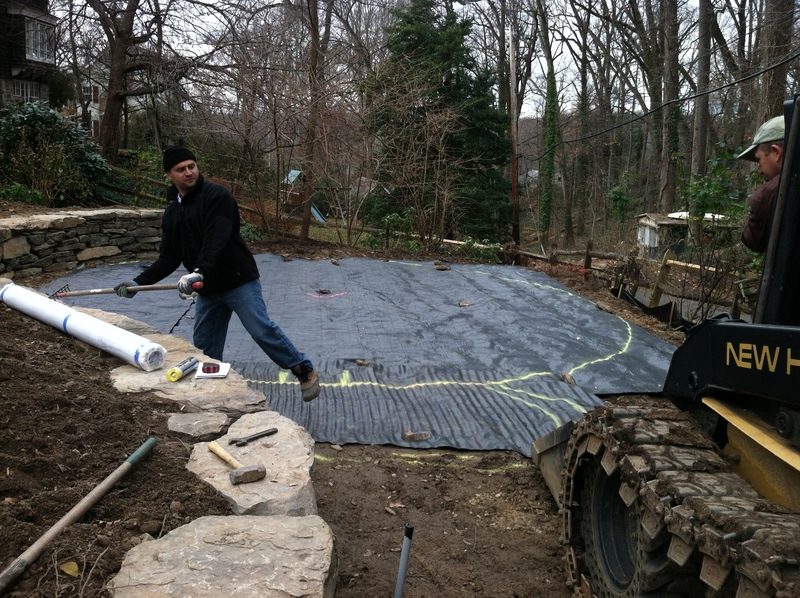 With those features in mind, my stone mason came in and installed an 85 foot long dry stack wall of colonial bluestone around the unit until the grade leveled off towards the rear. 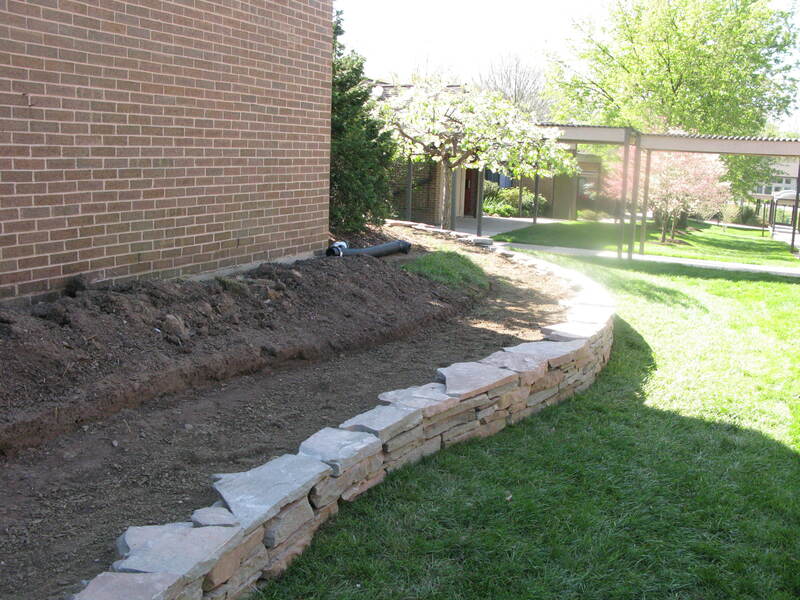 The wall was needed so that we could install a 30 inch wide pathway winding pathway to circumnavigate the entire landscape. 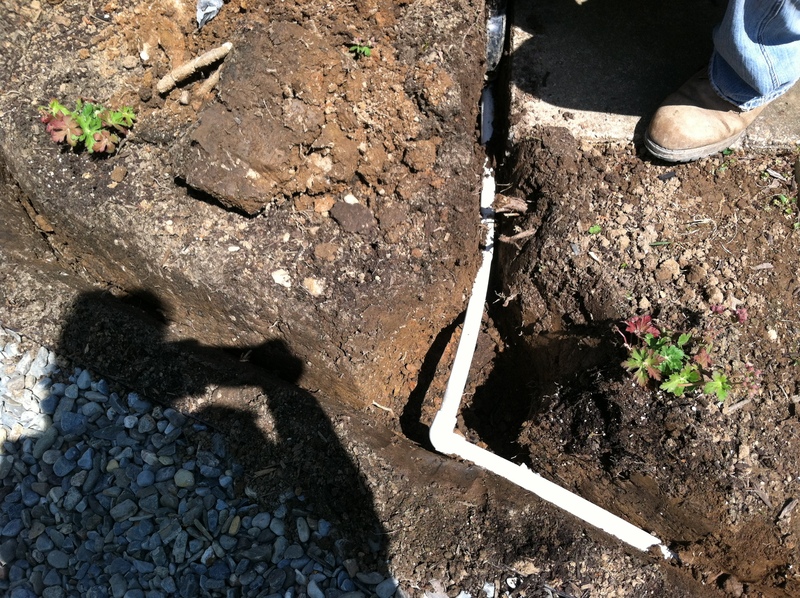 The drains were replaced, extended, and buried, ending with a pop-up green cap. The cap pops up when a downpour dumps rain and forces the top up to release the excess water. When installed, the only visible sign of the drain is the small green cap. 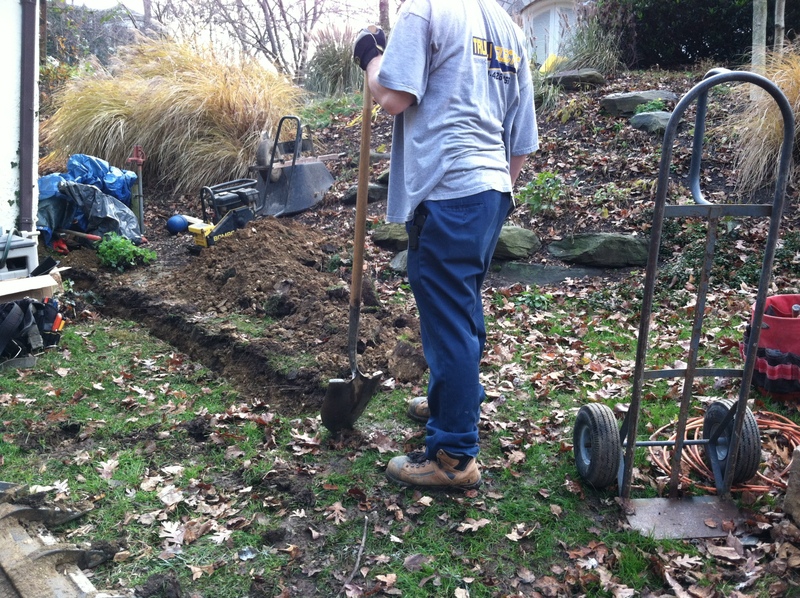 A 30 inch wide pathway was dug out, edged with a very sturdy metal edging that had to be staked and hammered in. 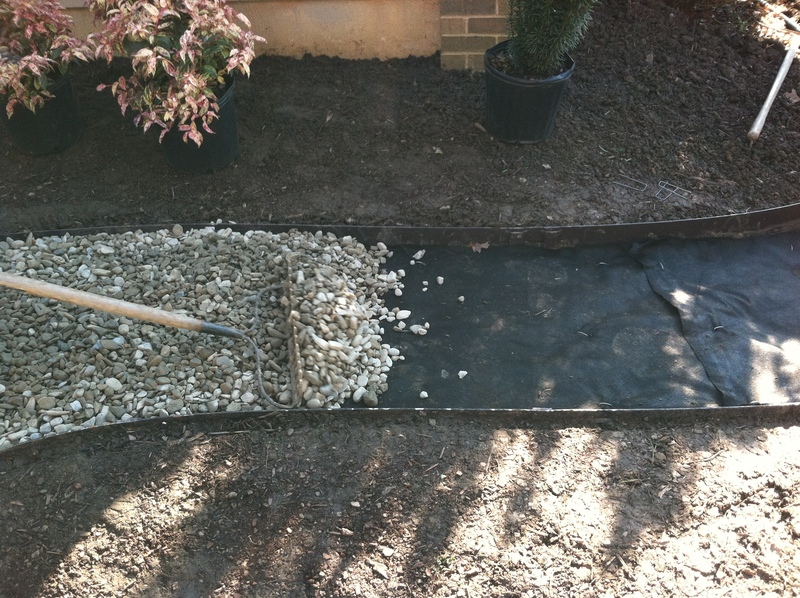 No flimsy plastic edging would be adequate for the heavy-duty river jack that would be used for the pathway. Landscape cloth was pieced in on top of the soil so that the river jack would stay put and not be mixed into the underlying soil. Soil pins fastened the cloth securely to the ground. Then the river jack was dumped in and raked about 2 inches thick. Outside of the sun room area, the client wanted a small sitting area to sit so that she could enjoy a nice summer day outside in the garden. A small patio 8 feet x 8 feet was installed with irregular bluestone pieces in stone dust edged with cobblestones to give it definition. 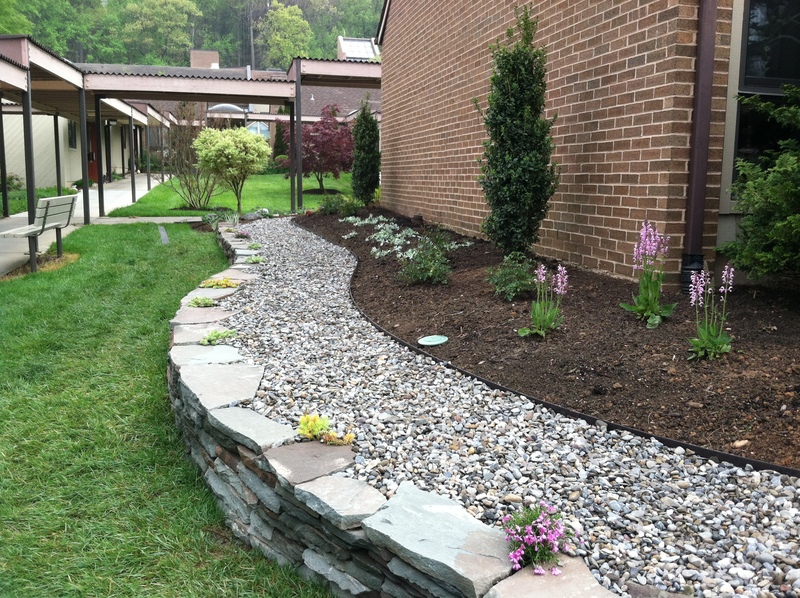 The plantings were installed immediately next to the wall area bordered by the pathway and wall. 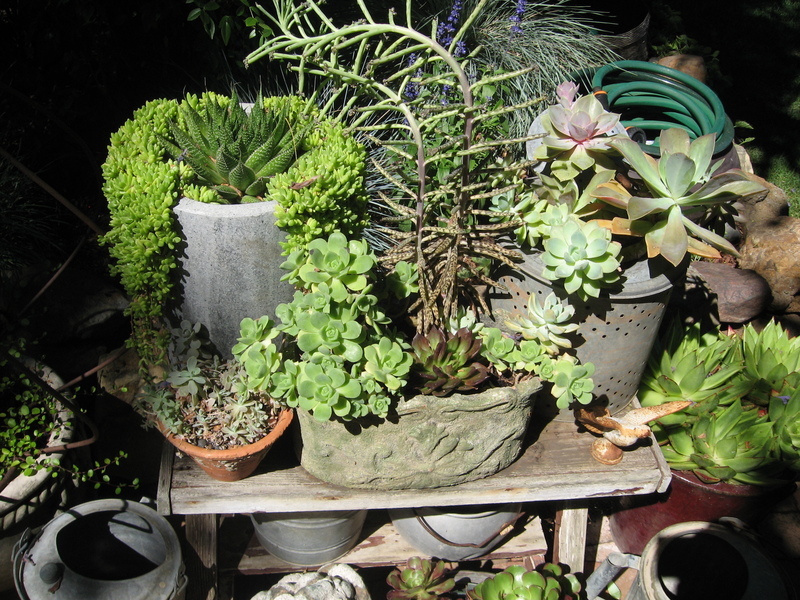 I had about 3 to 4 feet to plant things so each plant was carefully selected and placed. On a large south-facing wall that deer eaten yews had been removed earlier, we planted an espaliered magnolia flanked with fastigiate boxwoods, with an underplanting of apricot drift roses and Artemisia stelleriana ‘Silver Brocade’. The Artemisia is a great little silver leaved creeping ground cover for hot and dry situations. The shady front was planted with ‘Girards Rainbow’ Leucothoe, Cephalotxus fastigiata, or upright plum yew, Japanese Forest grass Hakenochloa ‘Aurea’, Hosta ‘MouseEars’ and a Tassel Fern, Polystichum polyblepharum, a real mouth full! Smallish boulders were sited to give some contrast with the Leucothoe. A small Acer ‘Butterflies was sited at the corner. 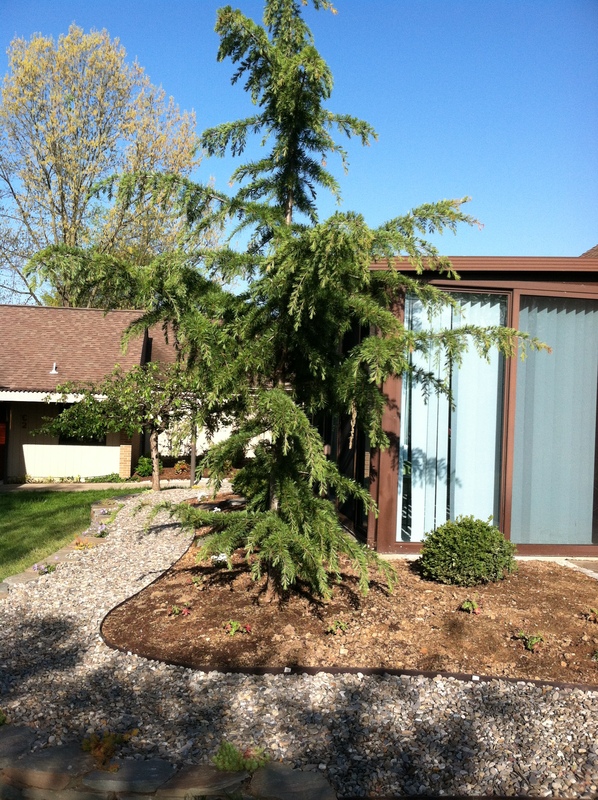 The rear was anchored with a tall 10 foot Cedrus deodor ‘Kashmir’, a very narrow upright variety. The tree was beautiful! I also included in the plan a miniature Crepe Myrtle ‘Cherry Dazzle’, a miniature Butterfly Bush ‘Blue Chip’, Nandina compactas, ‘Little Honey’ Oak Leaf Hydrangeas, ‘Centennial Spirit’ Hydrangea, and ‘Twist and Shout’ Hydrangea. The perennials included ‘Eveline’ Salvia, one of the best Salvias on the market. Also, Anemone ‘Whirlwind’ , Heuchera ‘Dales Strain’, miniature Amsonia ‘Blue Ice’, Geranium ‘Max Frei’, Ajuga ‘Caitlin’s Giant’, and Heucherella ‘Sweet Tea’. 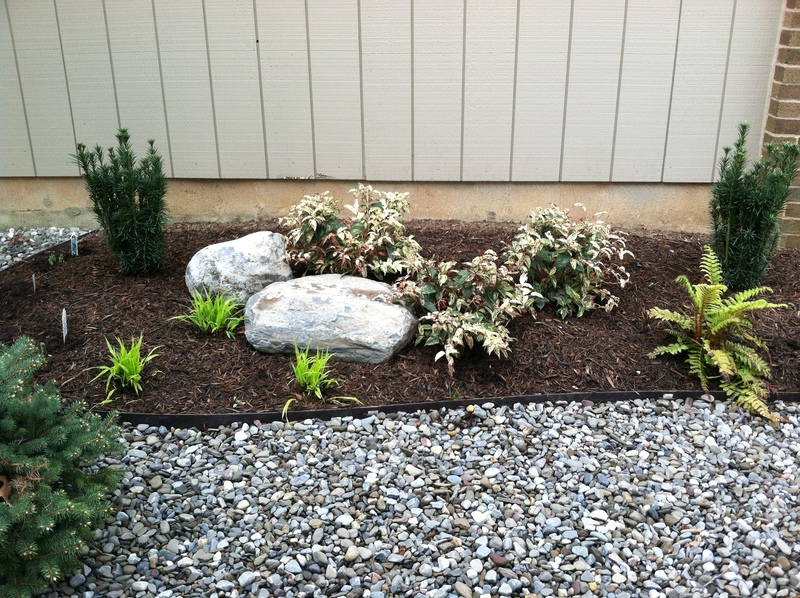 Along the wall in pockets, we planted Sedum ‘Angelina’ , and Sedum ‘Silver Stone to cascade. Also, some creeping Phloxes were planted in the wall crevices to grow along with the Sedums. 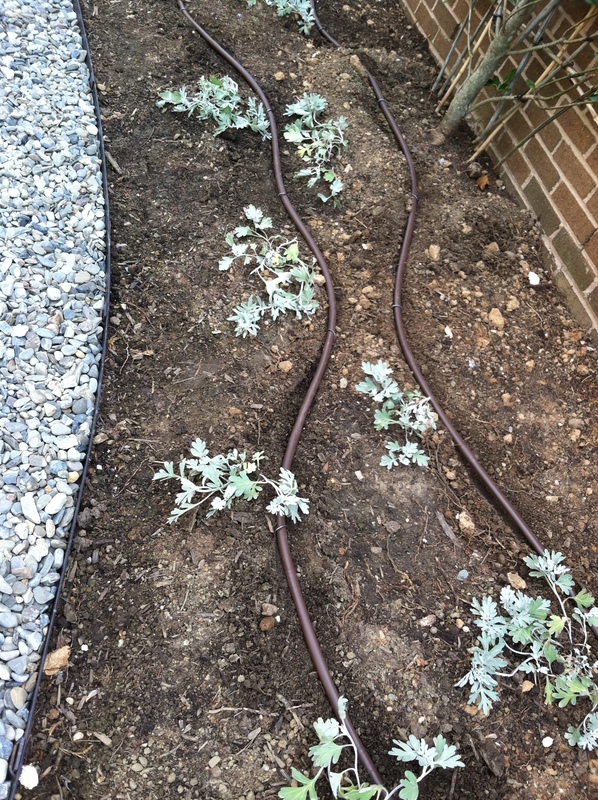 After the plantings were installed, the next step was drip irrigation. The irrigation is laid down with brown rubber hoses along all the plantings so the water is applied precisely to each plant. 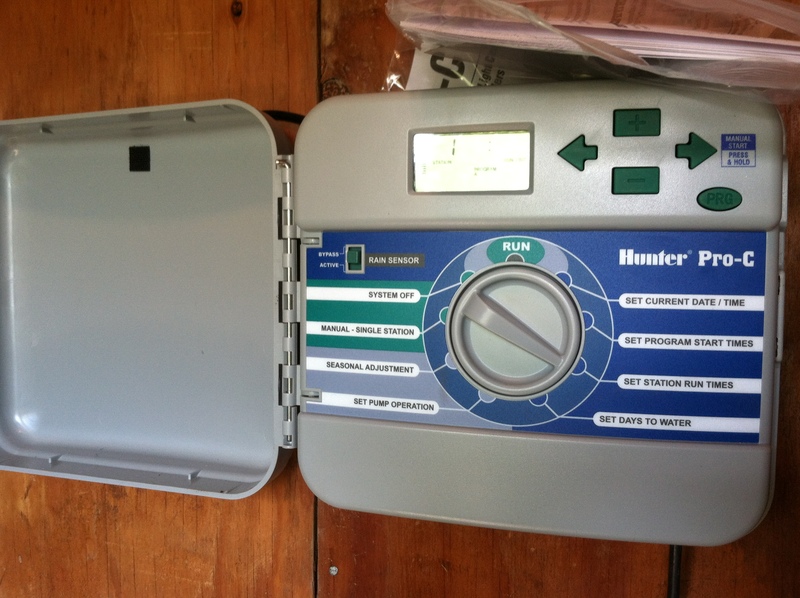 It is all connected to the control box which we was located in a nearby utility shed for easy access. 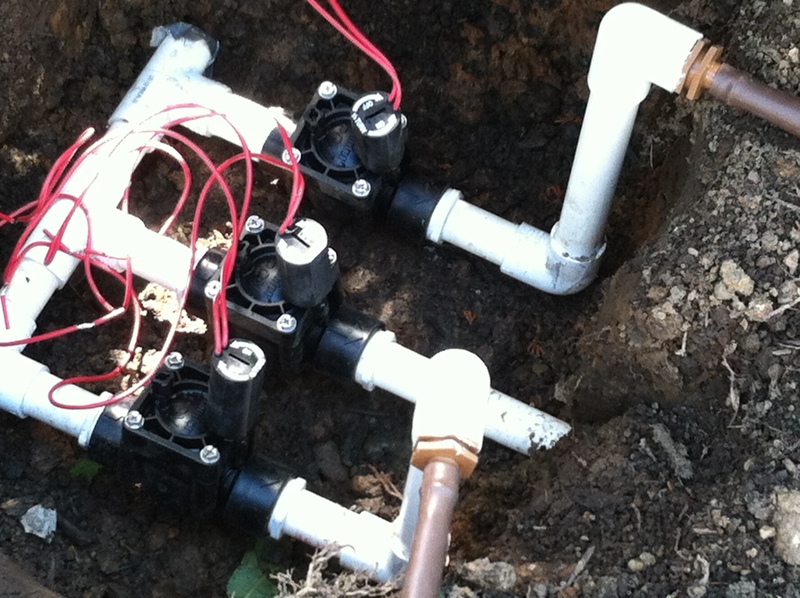 Irrigation controls valves for three zones- This was enclosed in a unit that was buried level with the surrounding soil. The property was divided into three distinct watering zones, a shady front, a hot south-facing area, and a partially shaded area in the rear. 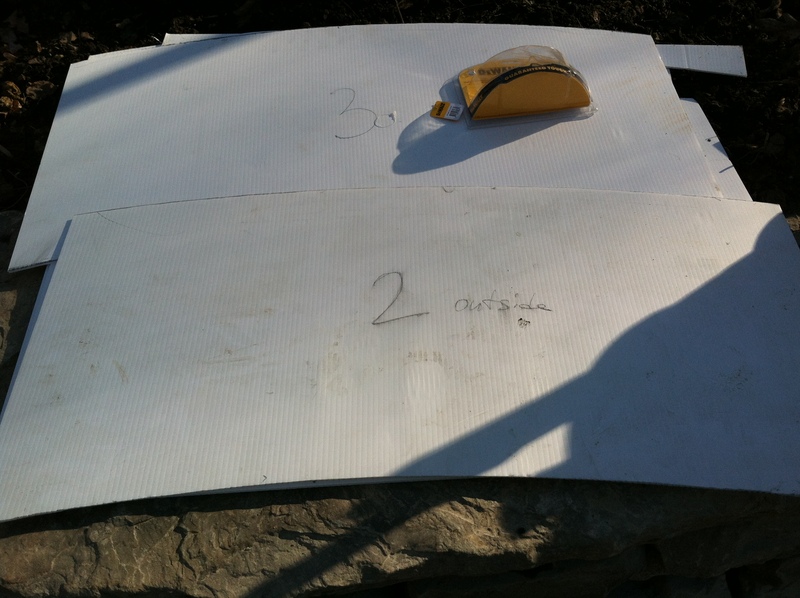 Each zone could then be calibrated to deliver water to the plants that had different water requirements. Initially, we set the drip to go on twice a week for 30 minutes at a time. This will be our base line and we will adjust as the conditions get hotter throughout the summer. 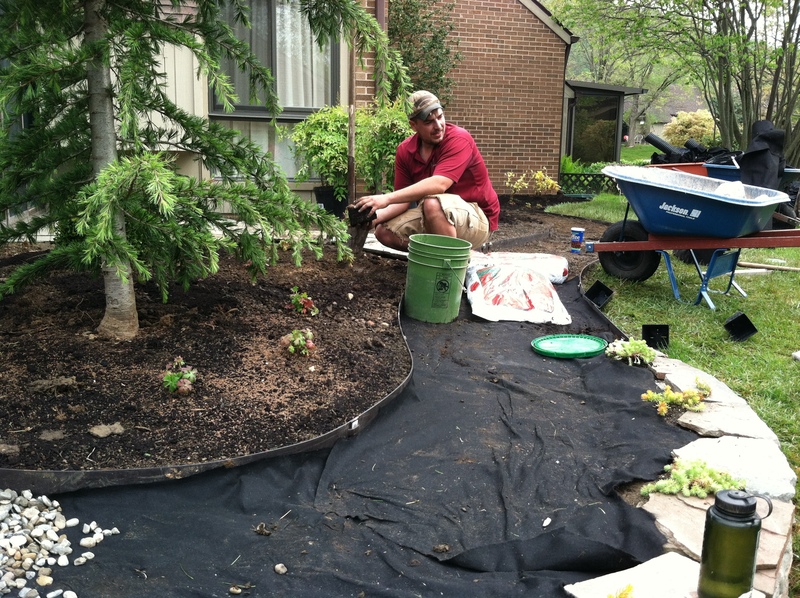 After the irrigation, the tan bark mulch was laid down to a depth of about 2 inches to cover up the brown irrigation pipes and to give it that finishing touch. Now the only thing left to do is to watch the irrigation and calibrate it to the correct times depending on the water needs. The entire job work time was only about 2 to 3 weeks in length. The planning process was much longer, a couple of months to get everything drawn out and prepared. I will be posting pictures of the installation as the summer progresses with updates.